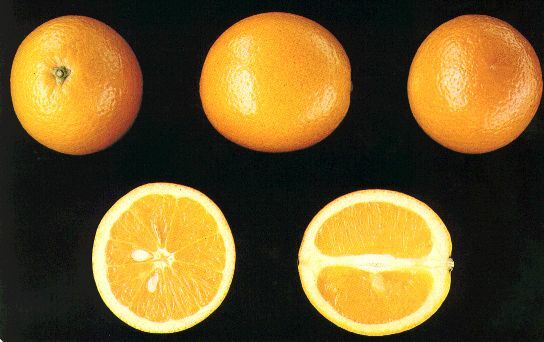 Until the end of the 15th century citron, sour orange, lemon and lime were the only citrus fruit known to Europeans. The crusades created an interest and a demand for new and exotic products. The independent states of Genoa and Venice maintained trading routes from Italy through Palestine and Arabia to India at great cost for several centuries. This increasing trade with India and the Far East and the great voyages of discovery at the end of the 15th century brought many novelties. The sweet orange was among them. The first written reference to sweet oranges dates back to 1472. A trader from Savona had sent a written bill of sale to his client mentioning 15 000 sweet oranges. 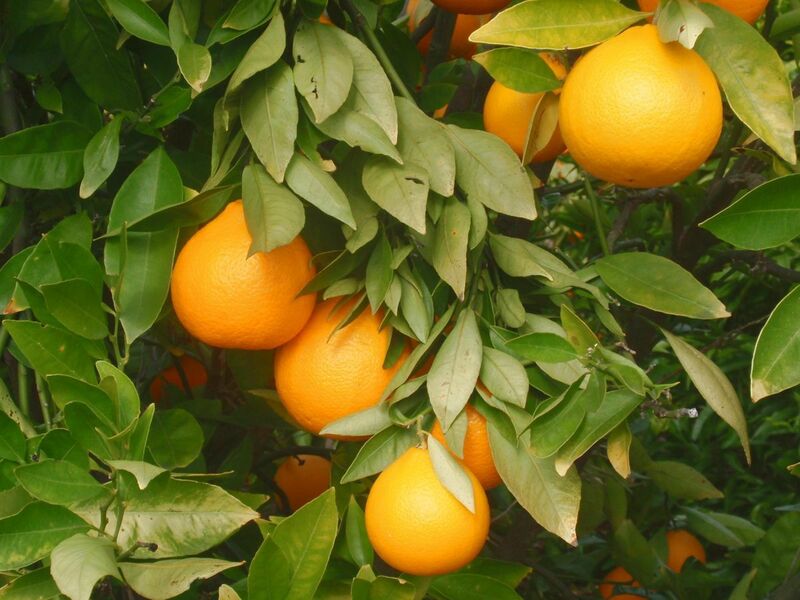 From literary sources we know that sweet orange was cultivated in Sicily, Calabria and southern Spain by 1525. 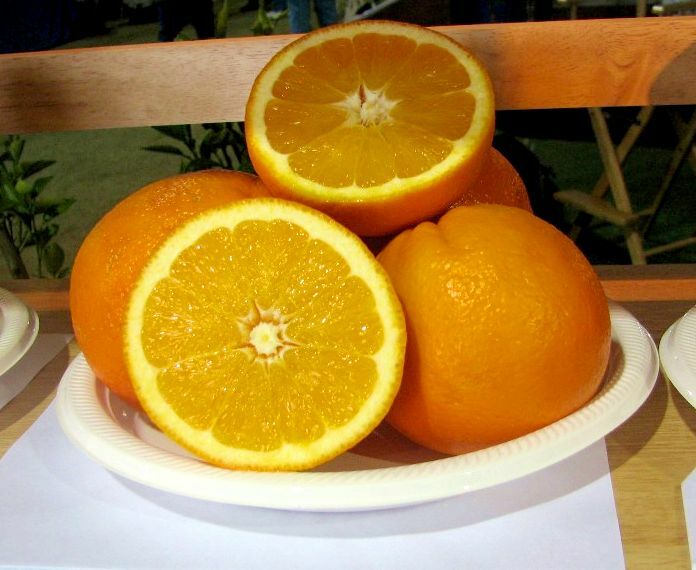 The varieties grown at that time were inferior to those we know today and both sweet and sour oranges were used as condiments for fish and meat. 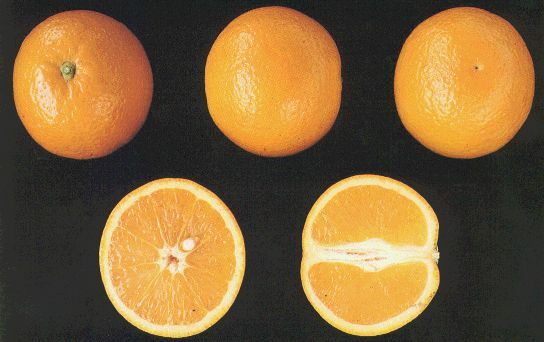 It is perhaps worth mentioning that the word orange always referred to the sour orange (Citrus aurantium) from the 11th century to the end of the 18th century. 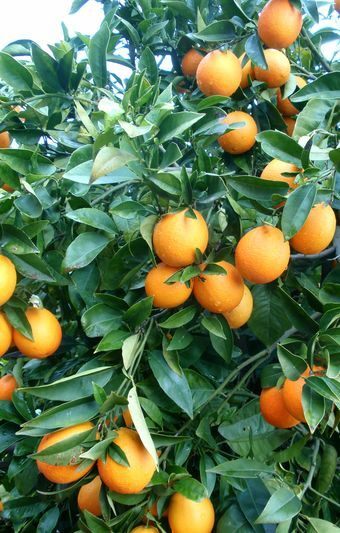 It was only after the Portuguese started importing new varieties directly from China in the first half of the 17th century that a new type called Portugal orange slowly spread to other parts of southern Europe. 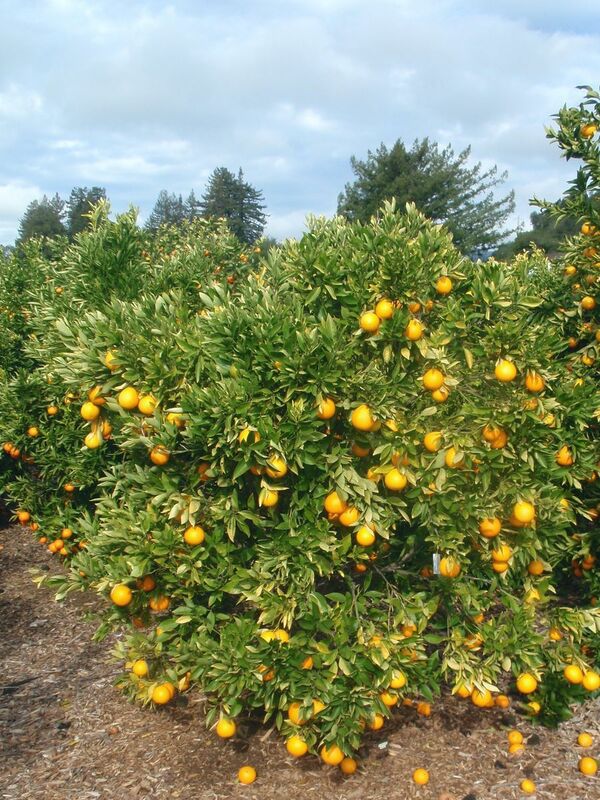 The first modern type of sweet orange tree was imported to Portugal in 1635. By 1650 it was known also in France and Italy. The fruit was sweet and could be eaten fresh, unlike other citrus fruits known at the time. 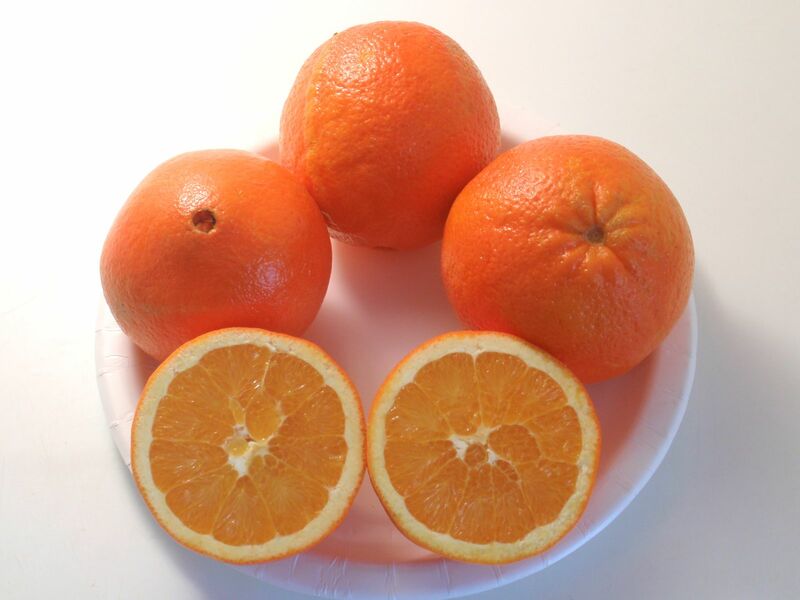 In many countries it was called Portugal orange; in fact the name of orange is still indentical to the name of Portugal in many languages: in Greece (portokalo), in parts of Italy (portogallo) and in Albania, Romania and several countries in the near east. Elsewhere it was called sweet orange or China orange. 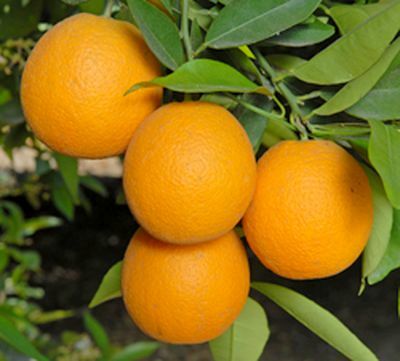 Its scientific name became Citrus sinensis (Chinese citrus). 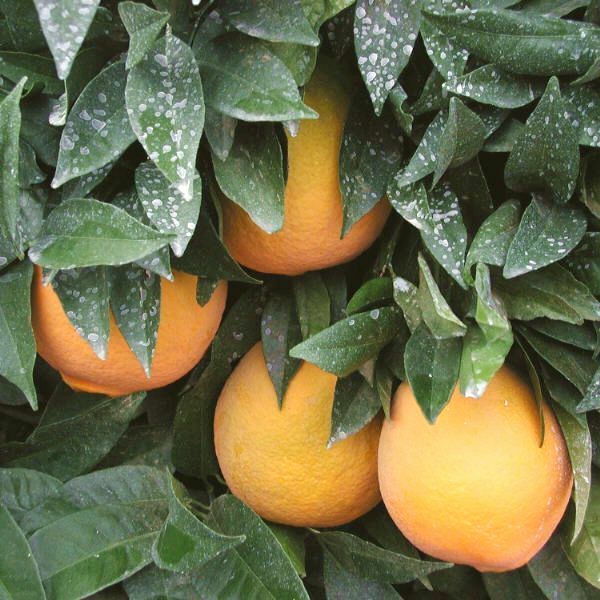 The building of special greenhouses to protect citrus fruit from frost (orangeries) became more common around the time of the spreading of the new sweet orange. 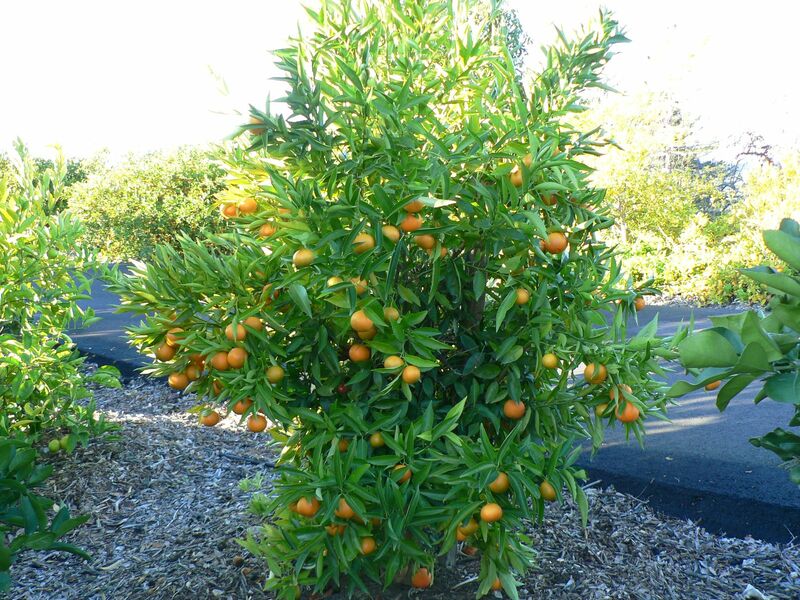 The sweet orange is a subtropical, not a tropical plant. 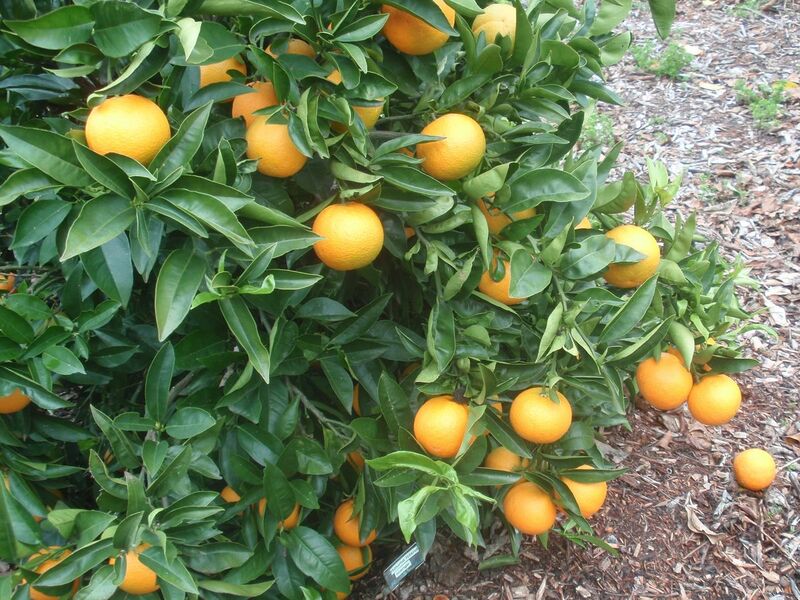 Sweet oranges thrive in temperate regions where the climate resembles the warmer areas of the Mediterranean. They need a lot of sunshine, warmth and water. The difference in temperature between summer and winter and between day and night is important for the flavour and colour to develop properly. In the heat of the tropics the fruit remain green even when fully ripe. Although excellent in quality, due to the lack of cooler nights the fruit do not develop an orange colour in the rind. In the tropics producers treat the fruit with gas to change the colour of the rind, making it more appealing to the consumer. Especially the lower temperatures of late autumn and early winter help to deepen the colour of the rind. The darker the desired colour the cooler the nights must be. Blood oranges thrive where nights are coolest but without frost. The sweet orange is highly intolerant of freezing temperatures. 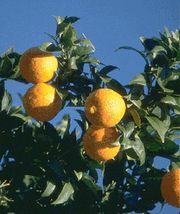 During the season 2007/08 the biggest producers of sweet oranges were Brazil, the United States, Spain, China, Mexico, Turkey and South Africa. 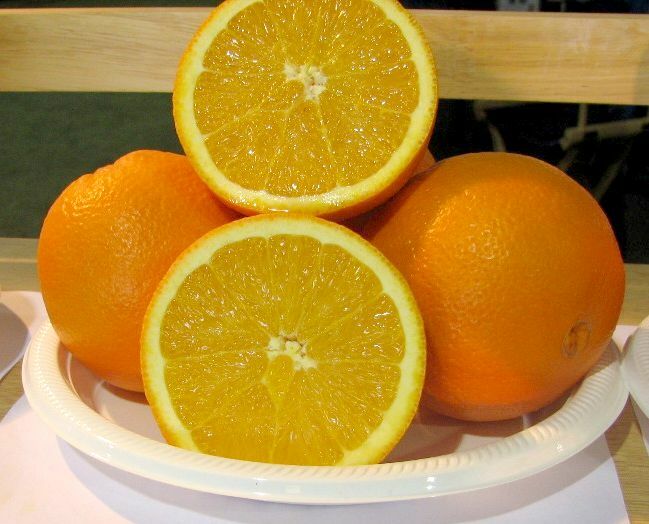 The biggest exporters of fresh oranges were South Africa, the United States, Spain, Turkey, China, Brazil and Mexico. 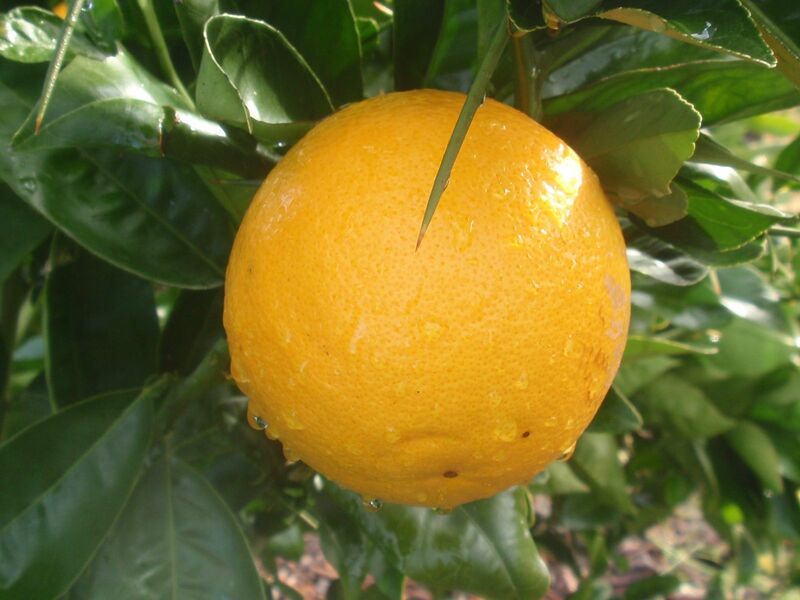 See Introduction Citrus world production: producers, exporters, importers. 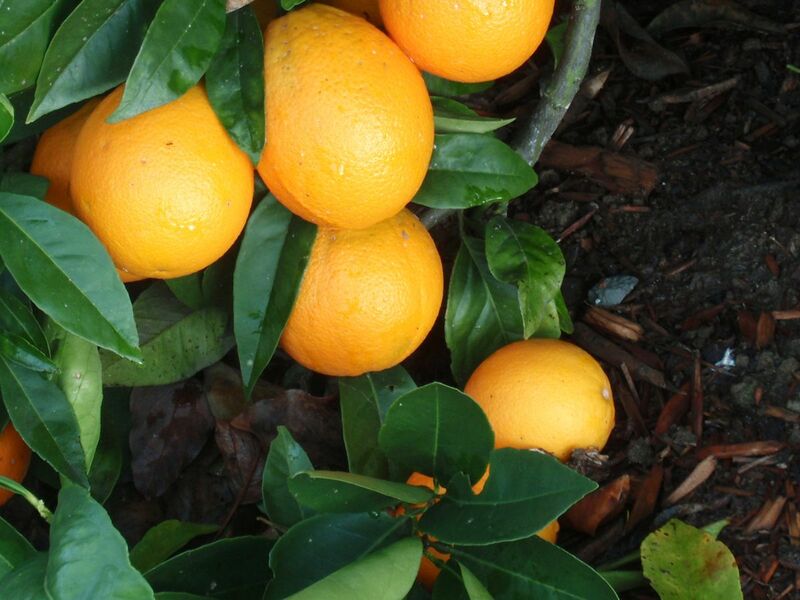 In suitable conditions some sweet oranges produce flowers and fruit almost throughout the year. A tree may bear buds, flowers and ripe fruit at the same time. Usually the main flowering season is in the spring and the main harvesting period begins in late autumn - early winter for the early varieties and continues until end of spring - early summer for the late varieties. The sweet oranges can be divided into four main groups: Blonde and early sweet varieties, Valencia oranges (late juicy varieties), Navel oranges and Blood oranges. have been moved to a page of their own. Sweet orange is a medium-sized tree with a rounded top and regular branches; twigs are angled when young, usually with slender, somewhat flexible, rather blunt spines in the axils of the leaves; leaves medium-sized, pointed at the apex, rounded at the base; petioles narrowly winged, articulated both with the twig at the base and with the leaf blade at the tip; flowers in small racemes or singly in the axils of the leaves, medium-sized with 5 petals and 20-25 stamens. 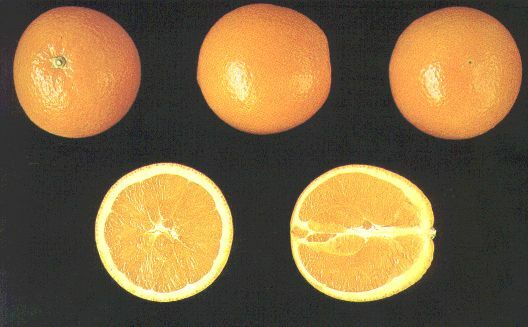 Fruits are subglobose, oval or flattened globose; peel thin, tight, not bitter, central axis (pith) solid. 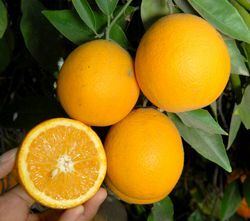 Citrus sinensis, the Sweet Orange is probably native to southeastern Asia, in northeastern India or, more likely, in southern China and Indo-China. It has been so widely cultivated for so long that it is no longer known in a truly wild condition. 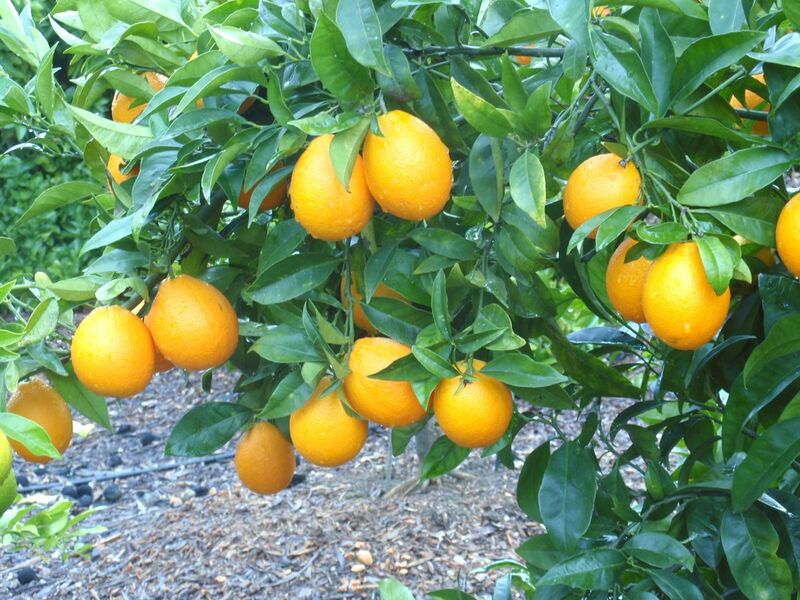 Sweet orange is by far the most widely grown fruit tree in the world and the second most commonly cultivated fruit. Banana, which is not a tree, is the number one fruit, grapes come third with apples in fourth place. 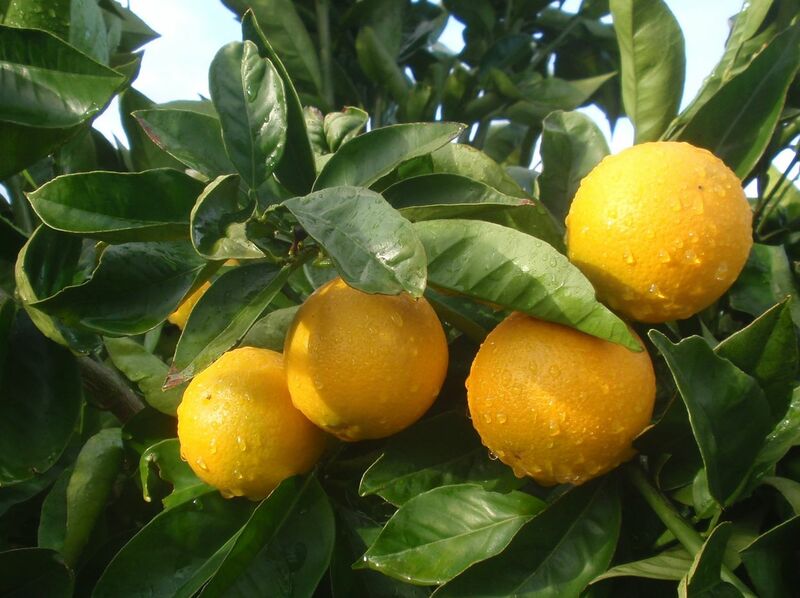 But if all citrus fruits are counted together they form the biggest group of cultivated fruit. Sweet orange has intrigued the minds of men long before it had been sighted in medieval Europe. Richard I of England (Richard the Lionheart) spent a year in Palestine from early summer 1191 till late summer 1192 on the third crusade (1187-1192). According to an old tale he visited the orange groves near Jaffa and after his return to England he could not stop describing his experiences and the nocturnal perfumes and sweet tastes he had encountered. However, we do not know the exact type of oranges that were grown there at the time. 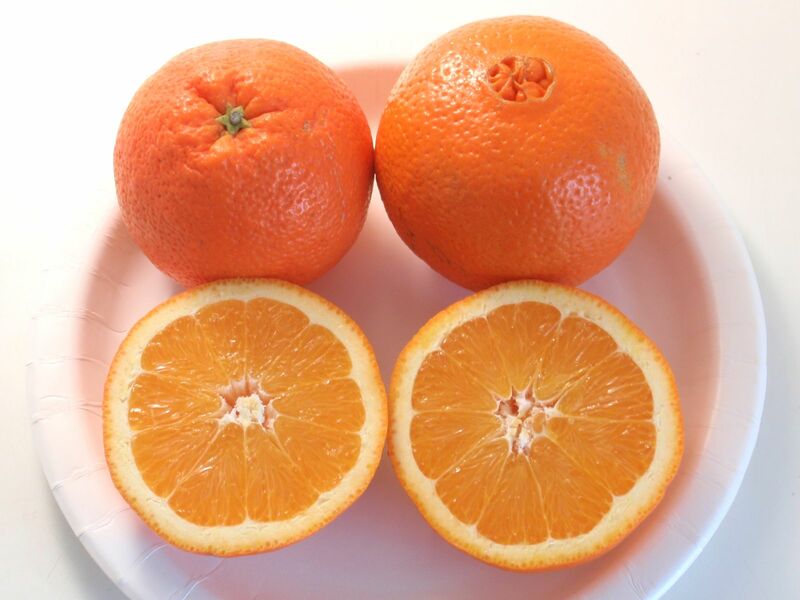 True sweet oranges came to Europe around 1635 through Portugal (see above). Although it took the sweet orange several centuries to establish its position as one of the world's most common fruits, the increased demand for fresh orange juice and the development of very early and very late maturing varieties have contributed to its present popularity and its year-round availability. 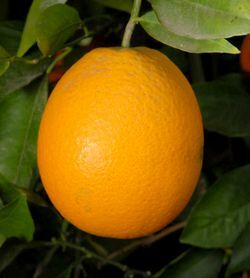 While Ambersweet is classified as an orange both for fresh and processing purposes it is actually a complex citrus hybrid. 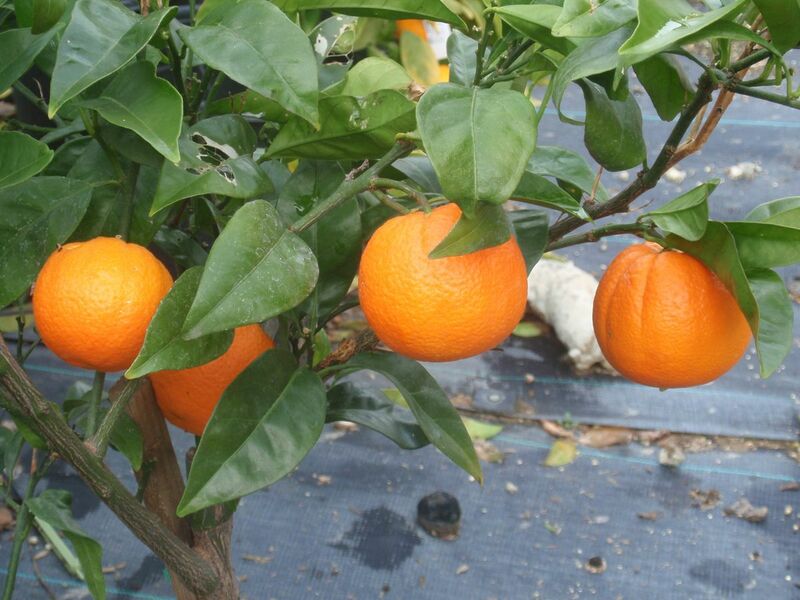 A mid-season sweet orange was crossed with a clementine x Orlando tangelo hybrid. 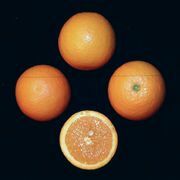 Since Orlando is a mandarin x grapefruit hybrid Ambersweet, to be precise, is 4/8 orange, 2/8 clementine, 1/8 tangerine and 1/8 grapefruit. The actual cross was made in 1963 and Ambersweet was released in 1989. The fruit usually attain minimum fresh fruit standards by mid October and minimum orange processing standards by mid November. 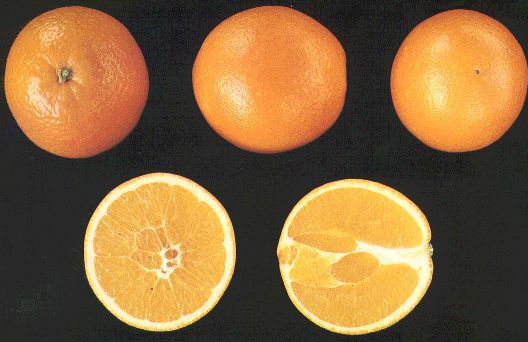 It can be peeled more easily than other oranges. 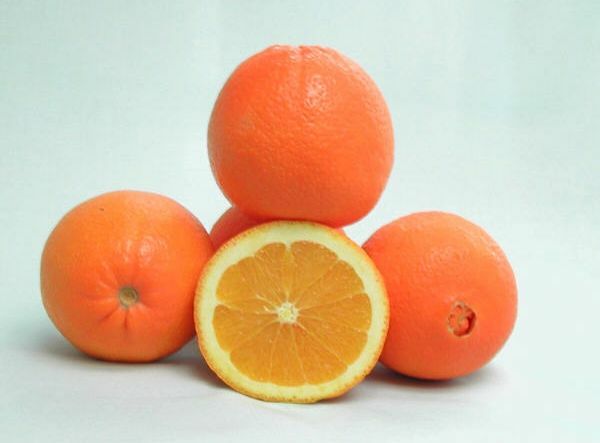 The fruit resemble those of navel orange in size and appearance more than other types and have a good orange rind and juice colour at maturity. The trees are moderately cold hardy and fruit can usually be harvested prior to damaging freezes. For identification purposes: the peel of a small developing Ambersweet fruit has a pubescent (fuzzy) appearance, a characteristic that disappears as the fruit matures. Fruit produced on trees in solid plantings of Ambersweet are likely to be nearly seedless, while trees in mixed plantings are usually seedy (0-30 seeds) due to the influence of cross-pollination. Ambersweet trees are moderately vigorous and tend to be upright in shape. Foliage is usually fairly dense. Young shoots may have small thorns. Ambersweet is popular as a dooryard tree. Berna (Verna) is of Spanish origin. 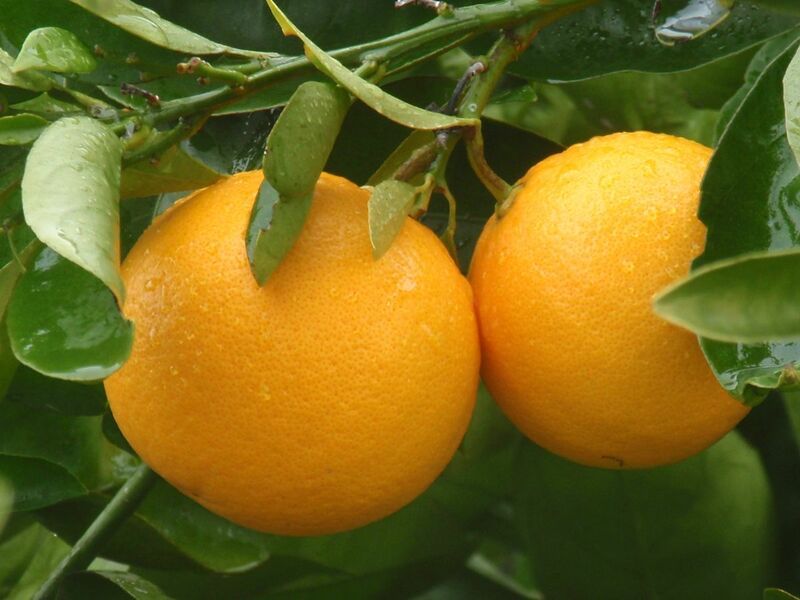 This distinctive blonde variety is an important late orange in Spain but it is grown also in Morocco and Algeria. Berna is one of the latest maturing of all Mediterranean varieties and holds on the trees as well as Valencia or better but is smaller and of poorer quality. Fruit medium-small, seeds few or none. Well-colored at full maturity, but regreens during summer. Rind medium-thick, firm; surface finely pebbled. Flesh well-colored; moderately juicy; flavor sweet. Fruit holds especially well on tree with good quality and ships well. Late in maturity (end of March), but earlier than Calabrese of Italy and Valencia. Tree slow-growing, compact, medium-small in size, and slow to bear but very productive. Berna is also known as Bernia, Verna, Vernia, Verda and Bedmar. Cadenera is a blonde variety of Spanish origin, presumably a chance seedling. It was found in 1870 and is one of the major varieties in Spain. 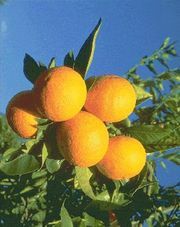 It is important also in Morocco and Algeria and hence ranks high among Mediterranean orange varieties. Fruit medium-sized, globose to slightly oval; apex somewhat depressed; practically seedless. Moderately well-colored. Rind medium-thin and surface smooth to finely pebbled. Flesh very juicy and flavor and aroma excellent. Holds well on tree and retains quality. Medium-early in maturity, fruit mature in November (preceded by Salustiana and Hamlin). The tree vigorous, hardy, large, and productive. Cadenera is also known as: Cadena Fina, Cadena sin hueso, Cadenera de Careagente, Comice, Cornice, Ducroq, Orero, Précoce de Valence, Précoce des Canaries, Précoce du Rharb, Valencia san Pepins. Castellana is Spanish blonde variety but the exact origin is not known. Fruit are medium-sized, subglobose to spherical; moderately seedy. Color light orange. Rind medium-thin and surface somewhat granular. Flesh color pale; juice abundant, low in acidity; flavor sweet. Holds moderately well on the tree without losing quality. Medium early, reaches maturity in November in Spain. Castellana is a productive tree and an important variety in the Almería Province of Spain where it matures earlier than elsewhere. Comuna is one of the oldest Mediterranean blonde orange varieties. The origin is not known. There seems to be several closely related strains and similar varieties are known in Italy (Comuna) and Malta (Malta Common). The tree is vigorous and very productive. The seedy fruit is medium-sized to big and very juicy. The mid-season fruit mature in December in Spain. Because of the existence of seedless varieties of higher quality in the same group, the importance of Comuna is slowly diminishing. Hamlin was found as a spontaneous seedling in the garden of A.G. Hamlin near Glenwood, Florida. It proved to be a new variety and was named after its finder. 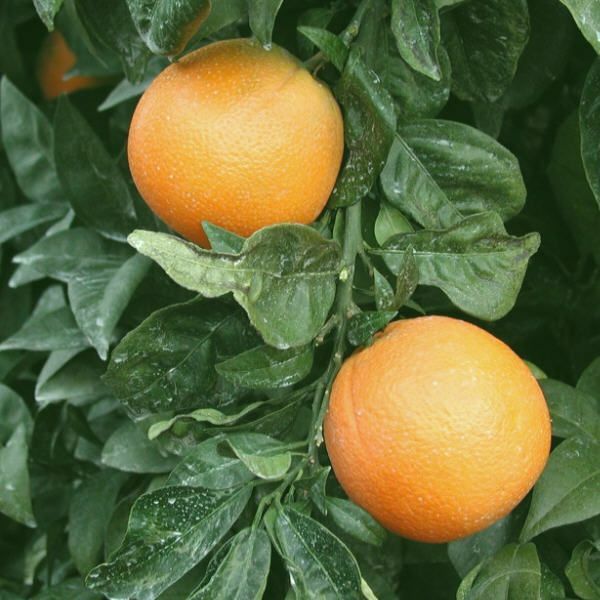 Hamlin has survived severe weather and several nights of frost, which has made it a popular variety in the northernmost regions of the citrus belt. Hamlin is an early variety, the first fruit reach maturity in October and are seedless. Hamlin is juicy and very productive. 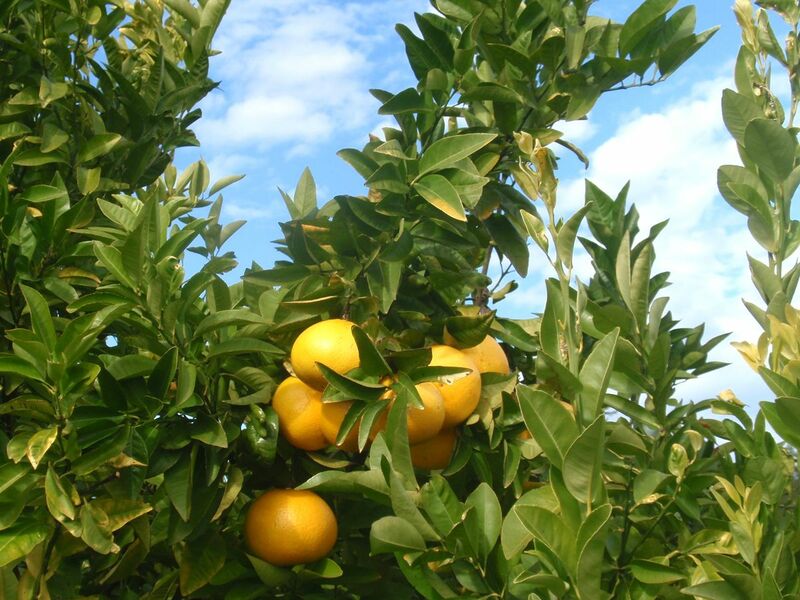 It is one of the most important varieties for the Florida orange juice industry. Hamlin is also known as Norris. 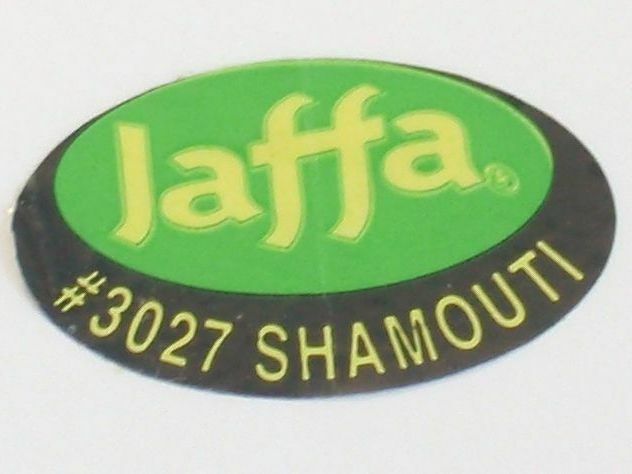 Jaffa (also known as 'Florida Jaffa') was introduced to Florida in 1883 from Palestine, but it does not appear to be quite the same as the original 'Shamouti' variety. Its fruit are small to medium, commercially seedless (0-6 seeds), with a thin, smooth peel. Peel color is yellow as is juice color. The flesh is melting in texture and of very high quality, producing a thick, nectar-like juice. 'Jaffa' usually achieves maturity by Christmas time. 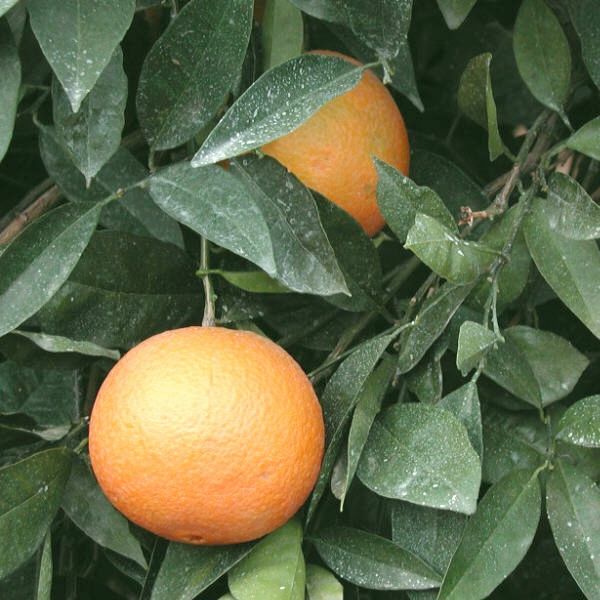 Flecks of pigment sometimes occur in the fruit during cooler winter conditions in Texas, so much so that the name 'Jaffa Blood Orange' has been suggested. 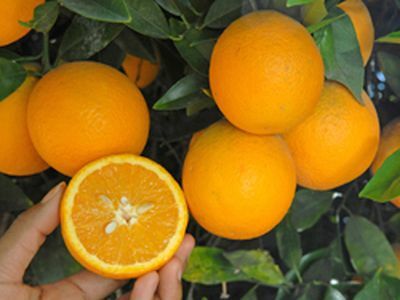 Jincheng, locally called Golden Orange, is one of the most popular oranges in China. 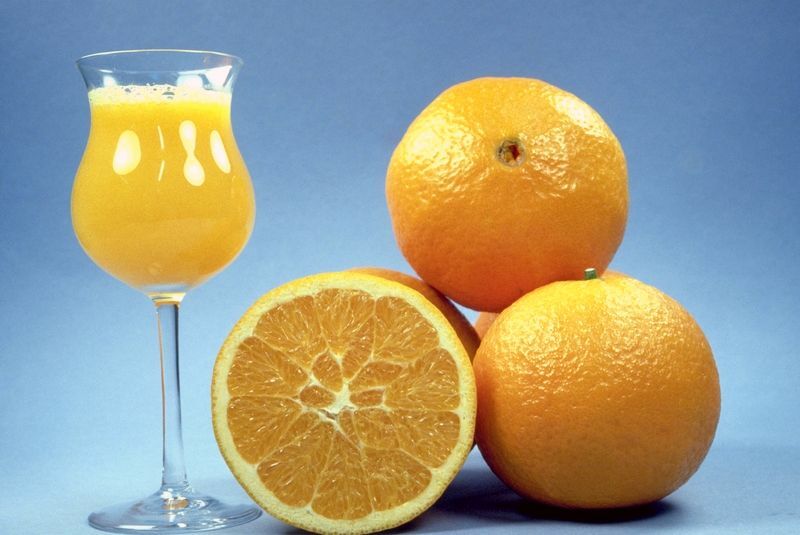 It is a variety that is well suited for the production of high quality juice. 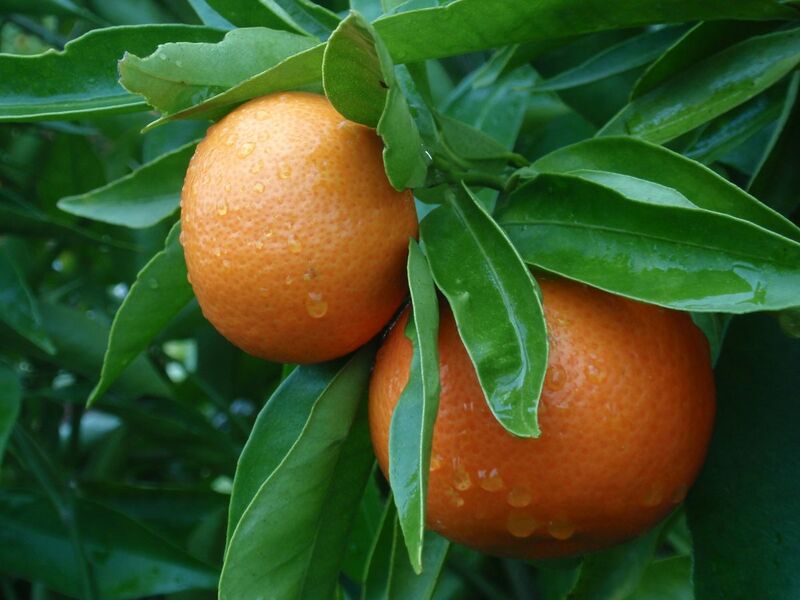 Because of its aromatic rind oil it is used in the production of sweet orange (essential) oil. 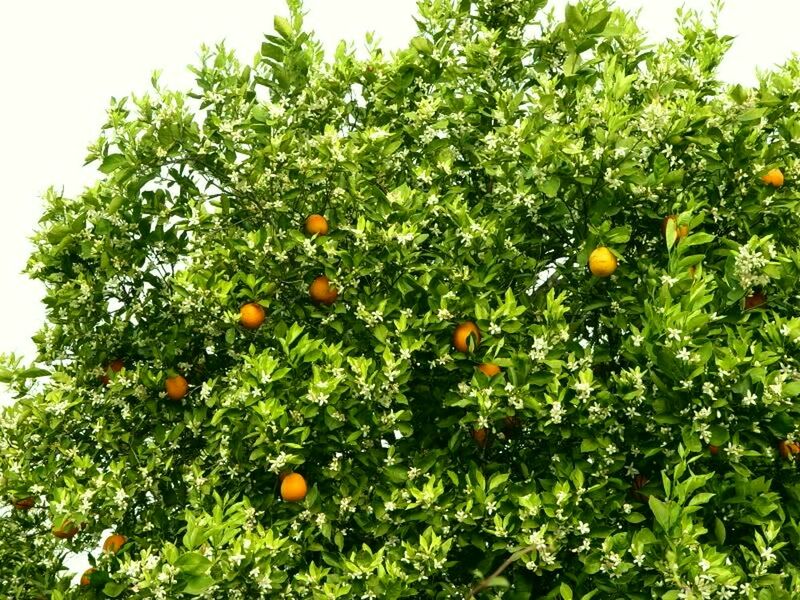 In China it matures in early December and stays well on the tree until early March without losing quality. Actually the acid to solids ratio improves until March after which it slowly starts to decline. Jincheng was introduced to the US by the USDA for development. It is a round, smallish fruit with generally only ten segments and some seeds. It has a thick, easy to peel rind and a sweet light orange pulp that has a hint of lime. Marrs arose as a limb sport of Washington navel in 1927 in Donna, TX. The tree is comparatively small. Its fruit are medium large, round to slightly oblate, with a thin, smooth, moderately thick peel that is easily bruised during harvest. It can contain as many as nine seeds. The peel is yellowish, as is the juice. The flavour is sweet but low in acidity. It matures in late September. 'Parson Brown' was discovered in a grove owned by Parson Brown in Webster, Florida. It was purchased, propagated and distributed by J.L. Carney between 1870 and 1878. It is rough-skinned, with pale juice; moderately seedy; of low-to-medium quality. It was formerly popular in Florida because of its earliness and long season (October through December), but has been largely replaced by Hamlin. 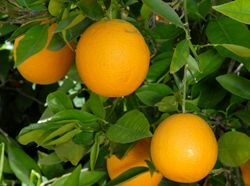 It is grown in Texas, Arizona and Louisiana but is not profitable in California where it matures at the same time as Washington Navel. It does not develop acceptable quality in the tropics. Parson Brown is also known as: 'Carney', 'Parson' and 'Porter'. 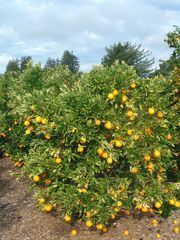 Pineapple orange originated from seedlings planted about 1860 near Citra, FL. It was propagated in 1876 or 1877 under the name of 'Hickory'. 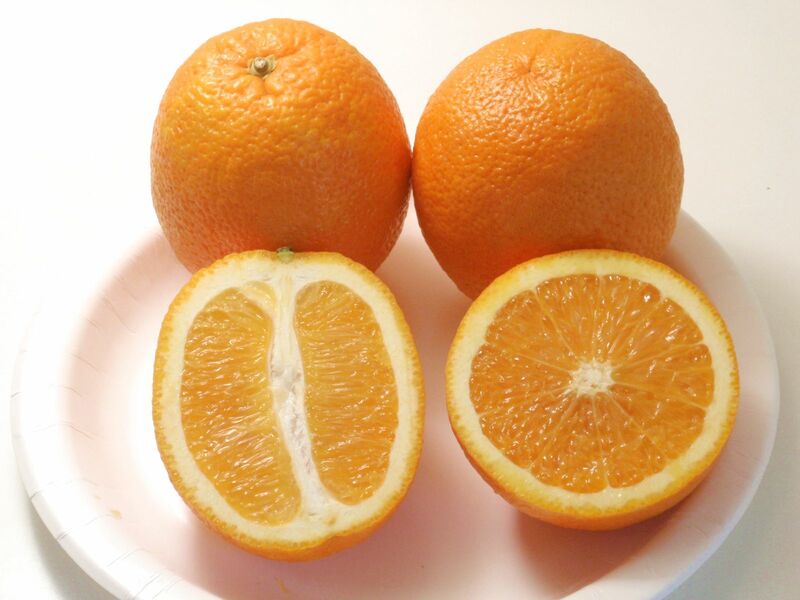 The fruit are medium large, somewhat flattened on both ends, with a moderately thick, smooth peel that develops good orange color under cool night conditions. Juice color and quality are very good. It usually contains 15-25 seeds. It succeeds on sour orange rootstock in low hammock land, on rough lemon in light sand. If the crop is allowed to remain too long on the tree, it may induce alternate-bearing. 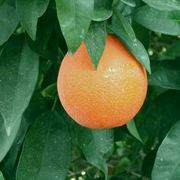 It is the favorite midseason orange in Florida. Pineapple matures in Texas about Thanksgiving. Unfortunately, the name Pineapple has been used in Texas to designate seedy oranges, which includes both Parson Brown and true Pineapple orange. Basically, if the orange in question matures well before Thanksgiving, it isn't Pineapple. Pineapple is also known as: Hickory, Pineapple-156, Ridge Pineapple and Ridge seedling. Rotuma is the most northerly of the Fiji islands. It is an isolated volcanic island with fertile, well-drained basaltic soils, an area of around 45 sq km, and a population of about 3000. 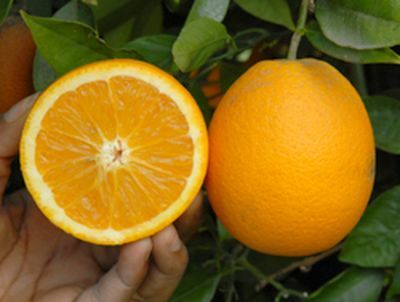 The Rotuma island orange occurs spontaneously throughout the island but plantings have increased in recent years as demand for their export has grown. The oranges are also used in the naturally fermented Rotuman orange wine, which is consumed in vast quantities over Christmas. 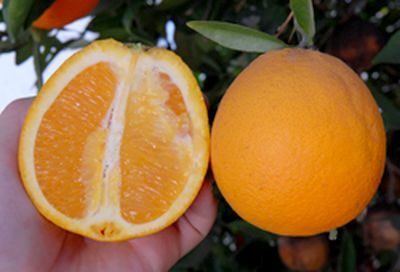 The Rotuma Island orange seems to do well in California where in good years it produces sweet juicy oranges with a complex spicy flavour. Salustiana (Salus), a highly-valued Spanish blonde variety is believed to have originated as a limb sport on a Comuna tree in the garden of a convent. It was called to the attention of Don Salustiano Pallas of nearby Enova, Valencia, and propagated and introduced by him about 1950. Fruit medium-large, subglobose to spherical and virtually seedless. Unusually well-colored at maturity. Rind medium-thick and surface moderately pebbled. The flesh is melting, very juicy and the flavor rich and sweet. Fruit said to hold especially well on tree without much loss of quality. Matures in November (earliest of the Spanish varieties). Tree is vigorous, somewhat upright, medium-large, and productive. Because of its early maturity, seedlessness, and high quality, Salustiano is a highly-regarded variety and has been planted to a considerable extent in Spain and somewhat in Algeria and Morocco. The Spanish Salustiana production in 2006 was 251 600 metric tons, mostly around Valencia, Cordoba and Seville. Both tree and fruit are almost indistinguishable from Cadenera, except that the latter is somewhat flatter in form. Salustiana is much earlier in maturity, however. Also known as: Pallas Salustiana, Salus and Salustiano. Don Salustiano Pallas owns the orange grove in Enova, near Valencia, where the variety originated. Shamouti, also known as 'Palestine Jaffa', is believed to have developed as a branch sport from an earlier variety called Beledi near the town of Jaffa, Palestine in 1844. The peel is thick but comes off easily in segments. The fruit is juicy, with a distinct flavour and of good quality. Unfortunately it has proven to be susceptible to disease outside its native area and recently it has been planted less often than before. It is still the number one variety in Israel and Lebanon, number two in Syria. Two later varieties have the same Palestine origin, Jaffa and Joppa, both introduced to the United States in the 1880's. The US Jaffa is often called Florida Jaffa as opposed to this Palestine Jaffa or Shamouti of Israel. 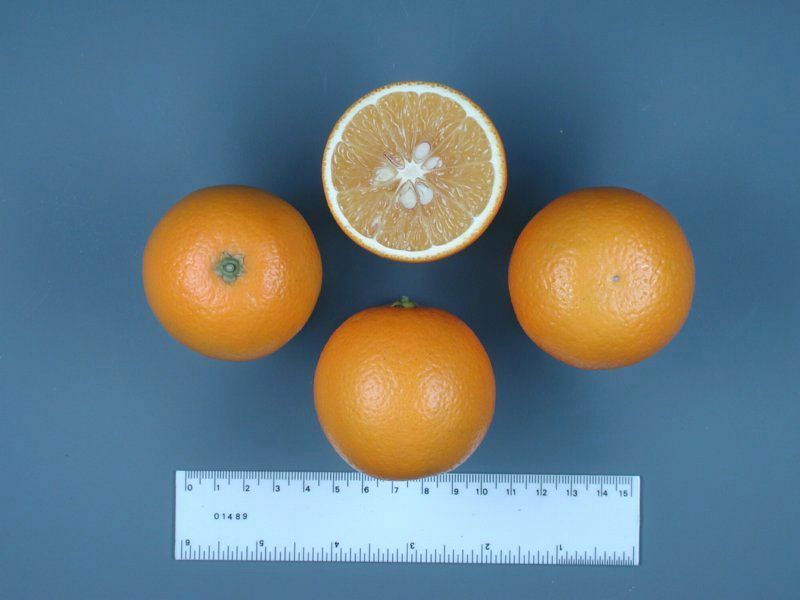 The Jaffa orange that is well known in many European countries is usually Shamouti and often the fruit carry a small sticker with the name Jaffa Shamouti (bottom picture). 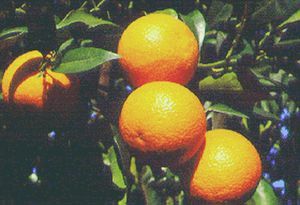 The Jaffa trademark, under which the Israeli citrus producers sell their fruit, covers several other citrus varieties as well and later orange varieties include Jaffa Navel and Jaffa Valencia. 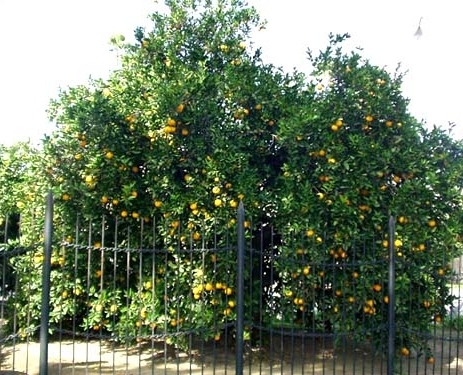 Trovita originated at the Citrus Research Center in Riverside in 1916 as a seedling from a fallen fruit that was presumed to have come from a Washington navel tree. The seedling was selected, described and named by H. B. Frost based on the Esperanto word for “found” in 1928 and was released in 1935. The fruit of Trovita are earlier maturing, smaller, juicier and milder in flavor than Washington navel. The trees are vigorous and upright in growth but have a tendency to alternate bearing. Trovita trees are more productive under desert conditions. 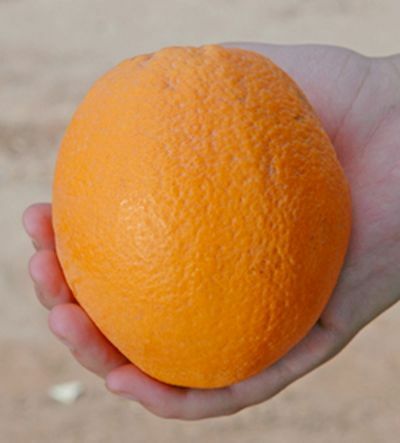 Valencia is the world's most important orange variety. It originated in either Spain or Portugal, no one knows which. It was introduced to Florida in 1870. It is a major variety in Florida, California, South Africa and Australia. Over 50% of the production is pressed for juice. Valencia grows well, is easy to cultivate and very productive. The fruit is of a high quality and commercially seedless (0-6 seeds). The peel is thin and the pulp is tender and very juicy. Valencia is a late variety and keeps well on the tree. It can be picked until late spring, or even early summer, which prolongs the season and increases productivity. Valencia is one of the oranges that also thrives in the tropics. The fruit are of high quality but in the heat and without cool nights the colour break does not occur and the fruit remain greenish in the tropics even when fully ripe. Producers treat the fruit with a gas to make the colour more attractive to the consumer. Valencia has many local varieties, the most important of which are presented further down. This Campbell nucellar seedling is indistinguishable from Campbell, but is more vigorous and thornier. 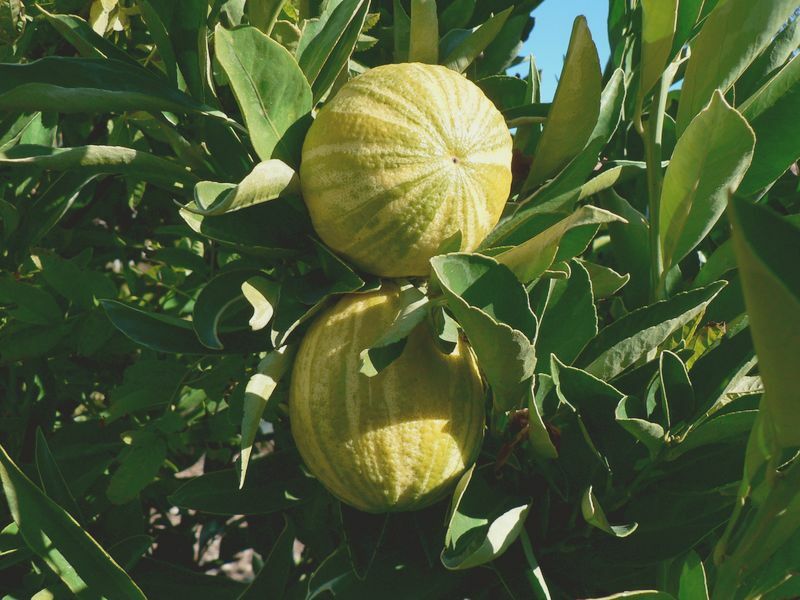 The original Campbell old budline fruit is indistinguishable from Valencia, but the tree exhibits certain consistent, discernible differences in vigor and behavior in comparison with Valencia. In trials of the two parent clones and of nucellar clonal budlines of comparable age, the trees of Campbell have consistently been more vigorous, thornier, larger, broader-topped, and slower to come into bearing than Valencia. The fruit has also been slightly lower in juice content than Valencia in the coastal region. The parent tree came to light about 1942 in the Early Campbell orchard near Santa Ana, which was planted in 1871. During recent decades Campbell has been planted considerably in California. More recently, this Campbell nucellar budline has achieved popularity. This California nucellar seedling was derived about 1935 by H. S. Fawcett of the Citrus Research Center, Riverside, from an outstanding old Valencia tree in the J. C. Cutter orchard at Riverside. This seedling budline was released in 1957 and is currently popular. Cutter is exceptionally vigorous and thorny and somewhat slow to come into bearing. Delta was found as a dooryard seedling in Transvaal, South Africa in 1952. It is vigorous and productive and grows more erect than Valencia. Delta has become popular because it is less acid and ripens earlier but has all the good qualities of Valencia. In the northern hemisphere Delta reaches maturity in January - February. Also known as Delta Seedless. This is a very late-ripening Portuguese variety that came to light in 1943 in the Dom João quinta (orchard) near Beja, Portugal. Dom João traces back to two very old trees, the sole remaining survivors in 1943 of a larger planting. The fruit of these trees was very late in maturing and held well on the trees through summer without loss of quality. Frost Valencia is a nucellar seedling derived about 1915 by H. B. 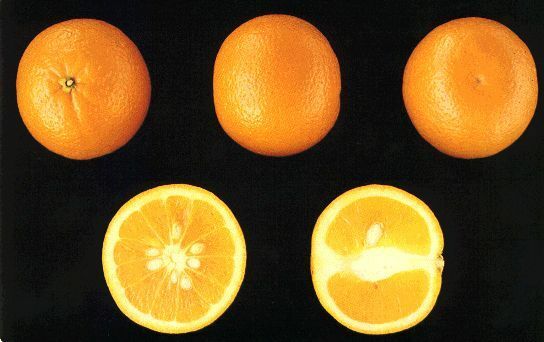 Frost of the Citrus Research Center, Riverside, and released in 1952. Exceptionally vigorous and productive, it is the oldest of the California nucellar budline selections and used to be the most popular. It has lost some of its popularity in recent years. Harward Late, a New Zealand variety is a seedling of Valencia with fruit that is indistinguishable from its parent. The tree is vigorous, large, and productive, and its overall performance is superior in New Zealand. Harward Late originated at Tauranga and probably represents a clonal budline of nucellar seedling origin. This is a budline selection of Harward Late made by John Wilson, in Keri Keri, NZ. The fruit mature from November to February in New Zealand. Tree is moderately vigorous with rounded bushy habit and a consistantly high yield. 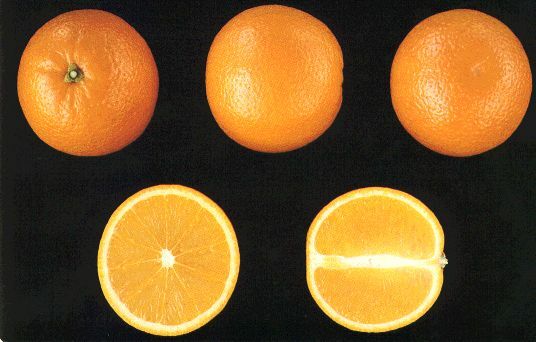 Fruit are medium to large; globose to oblique in shape; the rind thick (7-8 mm); moderately easy to peel and segment. 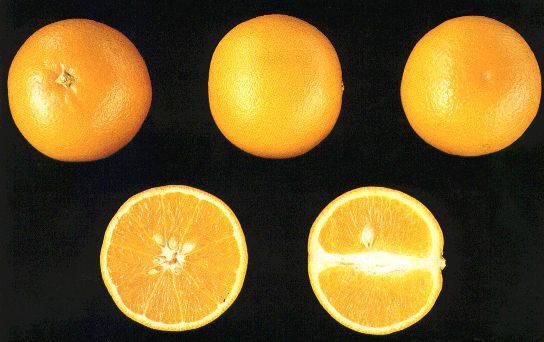 Flesh is orange when mature; moderately sweet (up to 6 seeds per fruit). 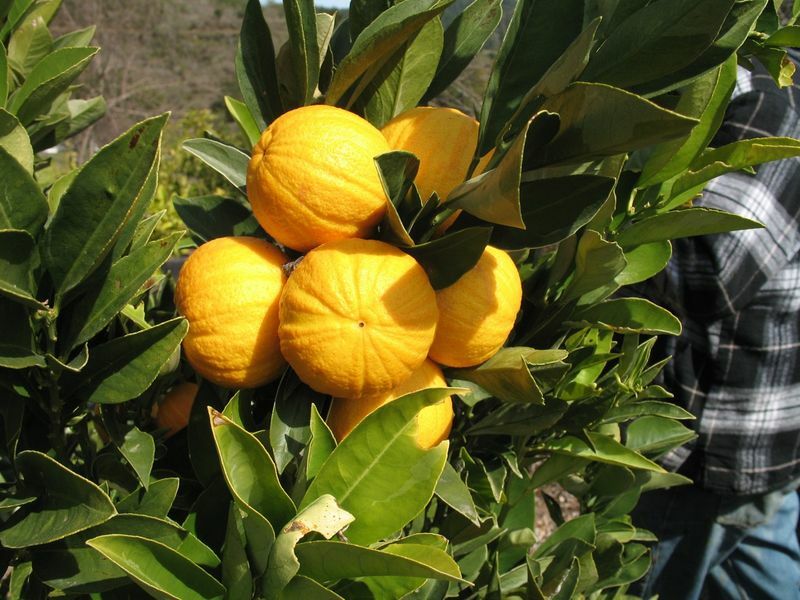 This is a good quality late maturing Valencia orange. The name 'Midknight' is not a spelling mistake. The orange was named after mid-season and its finder Mr. A.P. Knight, who first observed the tree as a somewhat earlier ripening Valencia variety in 1927 near Capetown, South Africa. Midknight is a virtually seedless, medium to large, somewhat oblong fruit of excellent quality and medium-late maturity. Midknight grows slower and is more susceptible to frost than Valencia but when fully grown yields a bigger harvest. It also has more sugar and fewer acids than Valencia. Olinda originated in California in 1939 and was released for sale in 1957. 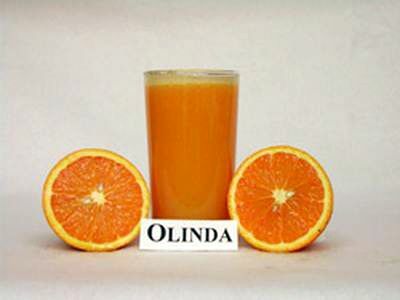 Olinda has aroused the interest of growers because in some cases it has proven to give a harvest twice the size of Valencia. Nucellar Olinda adapts well to varying conditions. It tolerates high heat and dryness better than other varieties and has shown promise in experiments in Saudi Arabia. The fruit are smooth, of fine quality, thin-skinned and full of juice. Although Valencia is a late variety and keeps well on the tree, an even later variety has been selected and released with the name Valencia Late. 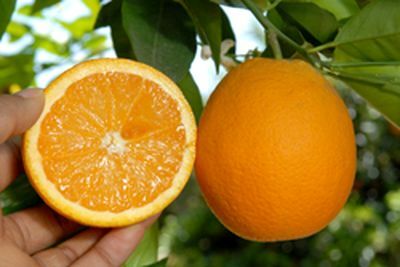 It is the last of all commonly grown orange varieties to mature and prolongs the availability of oranges globally to a year-round season. 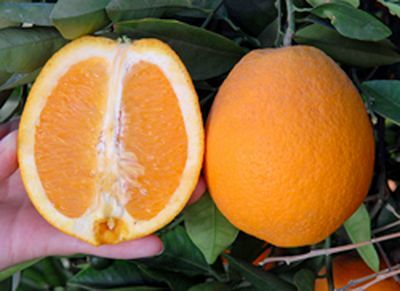 When the last Valencia Late oranges have been picked in the north, the first early varieties are ready for harvest in the southern hemisphere. After six months the situation is reversed. Cotidian Valencia is a variegated form of Valencia orange. The fruit taste like ordinary Valencias. 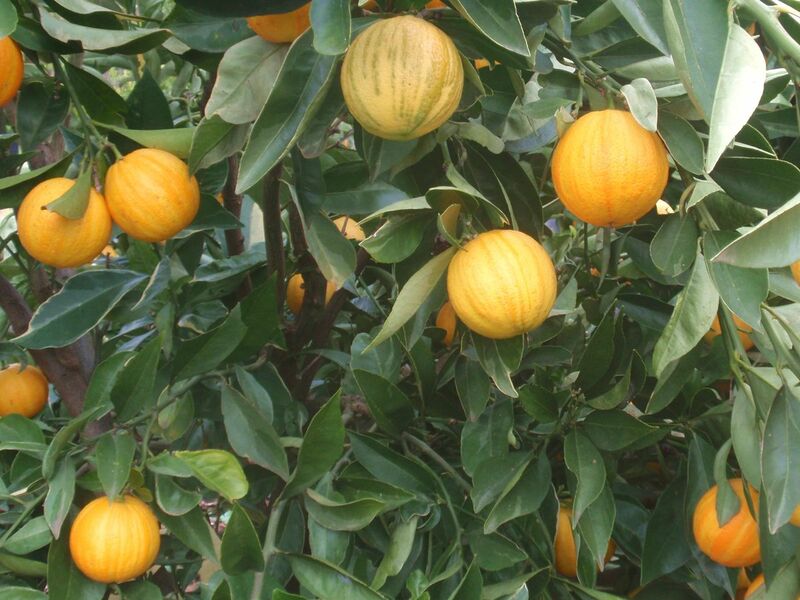 Variegated forms of citrus trees have been known for centuries. The reasons why variegated forms or mutations happen are not known yet. 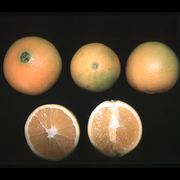 Variegated forms appear in practically all citrus types. Variegation can happen both in leaves and fruit. In leaves variegation can be total or partial. Especially in sweet oranges the variegation is not always complete. In young plants the variegation is usually stronger and when the tree grows and starts to set fruit the variegation sometimes partially disappears and the leaves can return to full green state. 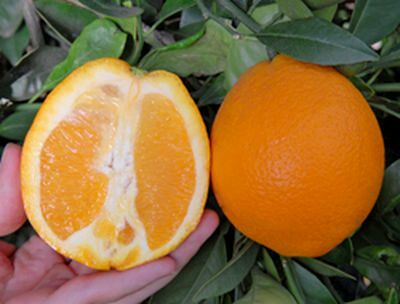 In sweet orange fruit the variegation is clearly visible only when the fruit are immature and usually disappears towards maturity. In certain types the variegation is accomppanied by furrowing of the rind on the darker parts of the skin. The furrows remain also when the fruit colour has broken to full orange. Variegated plants are often smaller and less productive than other varieties. The cause of this is not yet known but it can be due to chlorophyll deficiency since the variegation pattern includes less dark green leaf portions. Photosynthesis, the assimilation of sunshine, water and chlorophyll to form sugars that plants need to grow mainly happens in the green parts of a plant. Many variegated citrus plants are popular dooryard trees and container plants because of their decorative value and edible fruit. 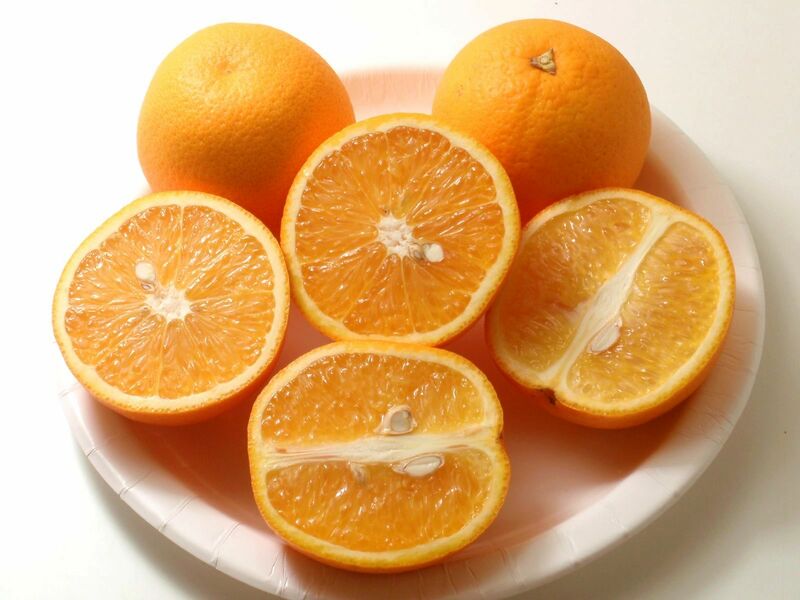 Navel oranges, a.k.a. 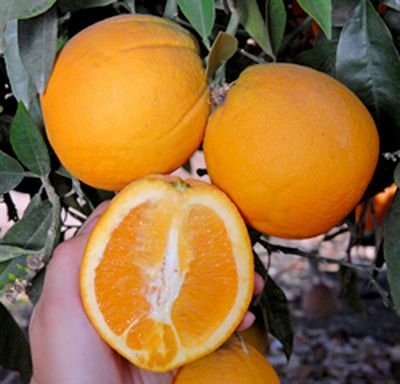 Bahia oranges, get their name from the navel-like protrusion at the lower end of the fruit. It is actually a secondary embryo inside the same fruit. Navel oranges have no functioning pollen. They do not cross-pollinate with other citruses and produce seedless fruit. 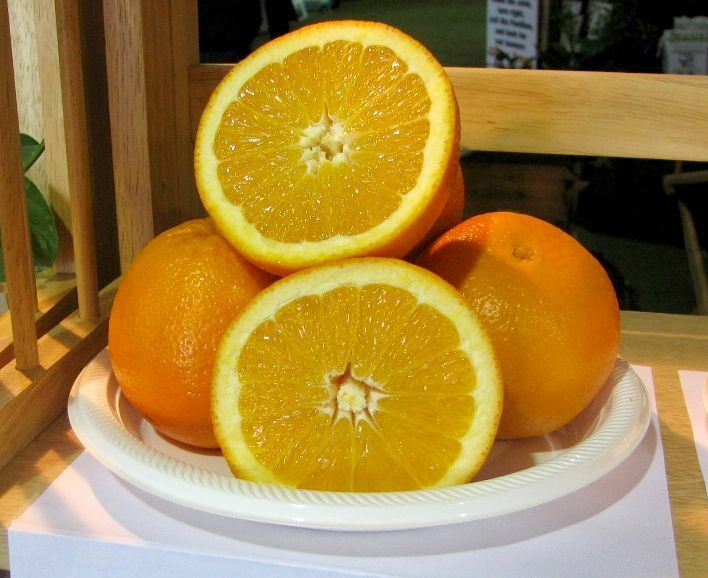 Navel oranges are propagated from budwood and recently by cloning. Cloning is the most cost-effective way of propagation especially in developing countries. 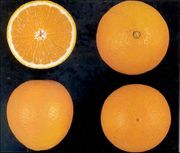 Many navel varieties grow somewhat slower and smaller than other orange varieties. Navels are thought to have originated in Brazil. 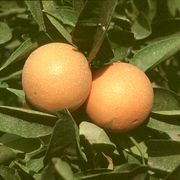 Atwood (Atwood Early) navel orange originated as a bud sport of Washington navel on the property of Frank Atwood in Lemoncove, California, around 1935. 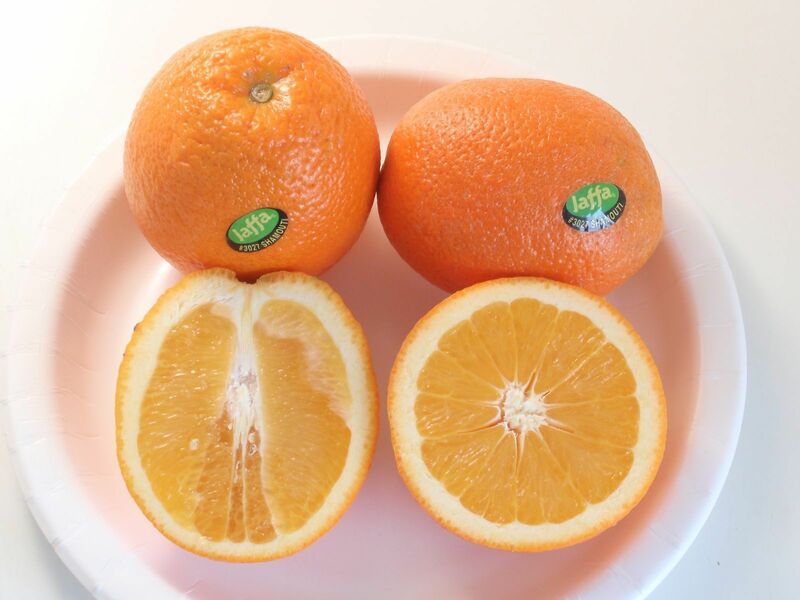 The fruit characteristics are very similar to the parent navel orange, but the rind develops color slightly earlier than the Washington navel and the rind is slightly smoother in texture. In addition, the fruit stores especially well on the tree without a significant loss of quality. 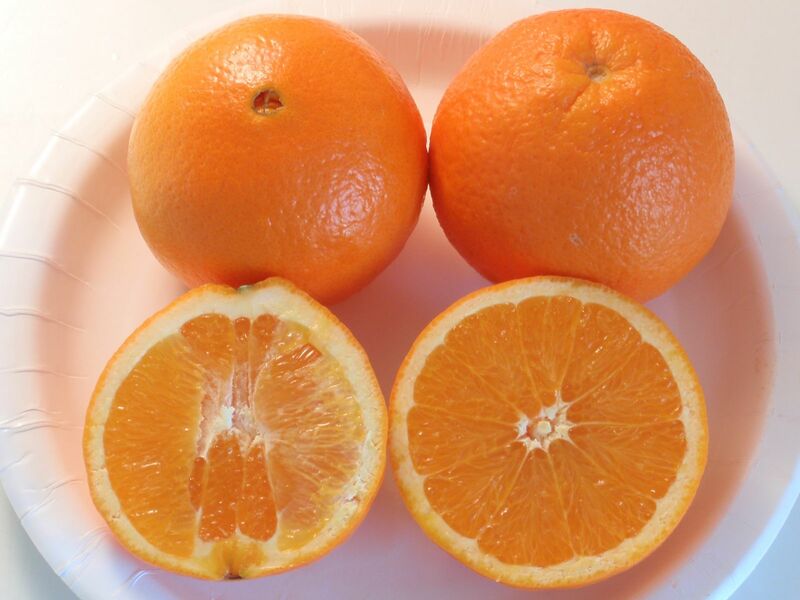 However, during the early part of the season the quality is not quite as good as the Washington navel. Fisher navel orange arose as a bud sport of the Washington navel orange. It was introduced by Armstrong Nurseries who had received it from Mrs. Fisher. 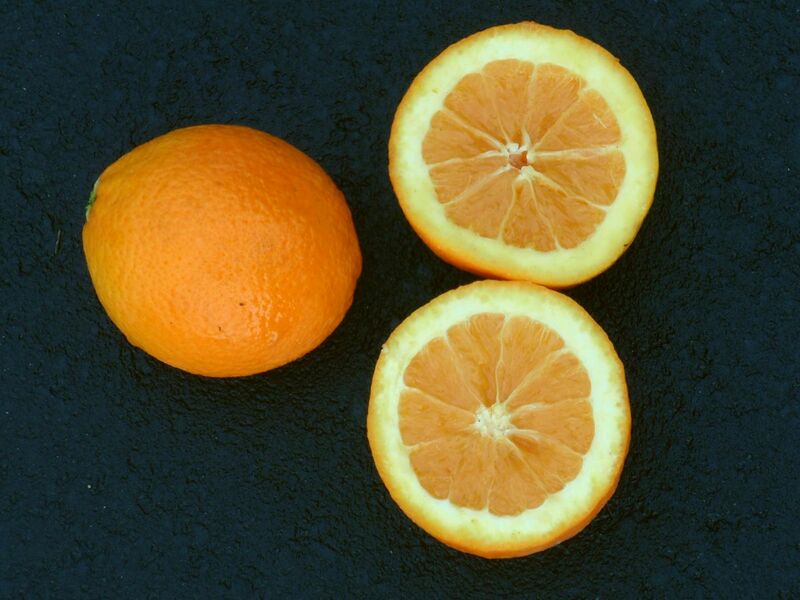 Fisher is an early season navel orange cultivar that reaches 8:1 solids to acid ratio ahead of Atwood, Bonanza, Newhall and Washington navel in Lindcove, California. Fisher matures about the same time as Beck-Earli and Fukumoto. Other characteristics are almost indentical with Washington navel. 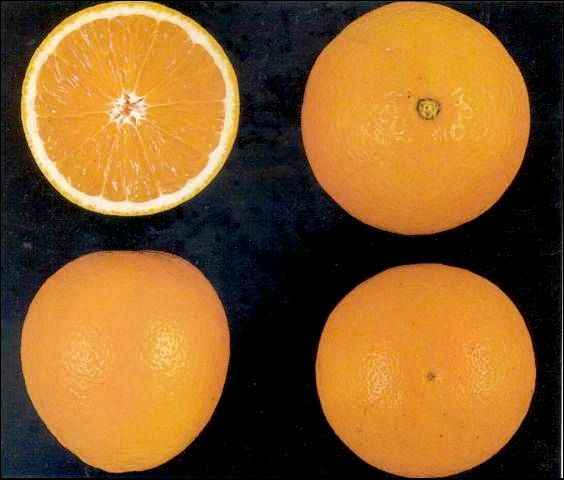 The Navelina navel orange has an interesting history. 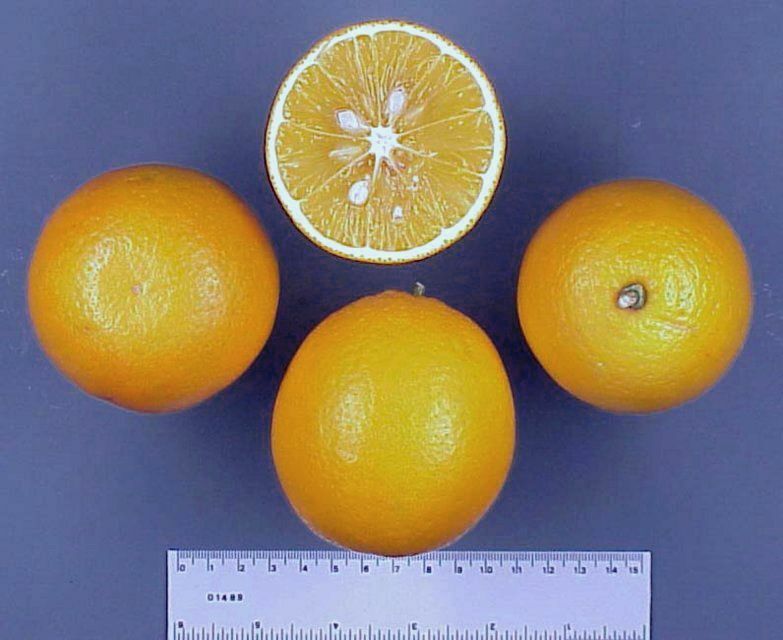 Navel oranges that would mature even earlier than Washington have long been sought. A budsport found in Riverside, California in 1910 was exported to Spain in 1933 for further development. It was extensively selected and re-introduced to the market in 1990 as Navelina, 'a small navel'. 80 years of development had produced a medium-sized slightly pear-shaped fruit with a small navel. The rind is very smooth and reddish orange at maturity. The fruit mature very early and are juicy with a sweet flavour that is slightly more sprightly and flavourful than Washington navel. Originally named Smith's Early the fruit is also known as Dalmau and Washington Early. 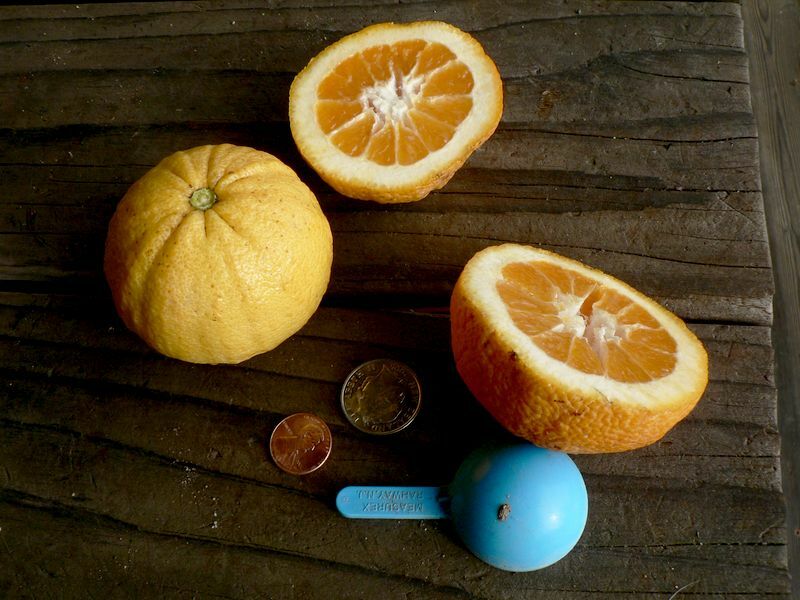 Skagg's Bonanza navel orange is a bud sport found by John Walker in the orchard of Mr. Skaggs of Lindsay, CA. 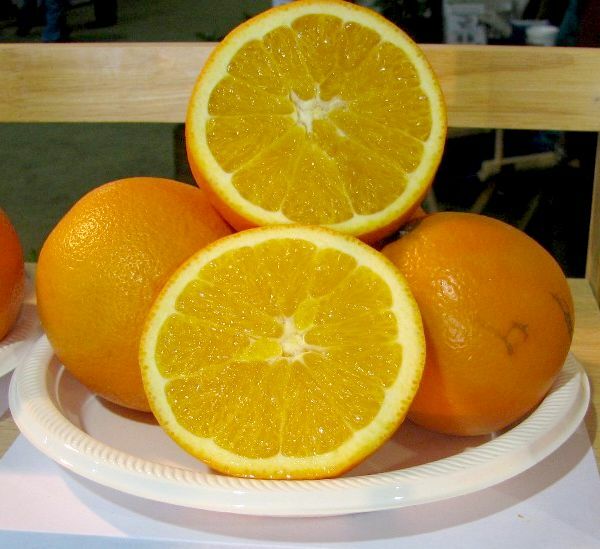 The Bonanza fruit has good size and a very thin rind compared to Washington, Newhall, Fisher and Lane Late navel oranges. In addition, the fruit of Bonanza tends to drop earlier in the season than the other selections listed above, so they need to be harvested early in the season. Bonanza reaches color break about two weeks earlier than Washington navel and an 8:1 solids to acid ratio about a week earlier. Bonanza also reaches color break ahead of Fisher navel, but it reaches an 8:1 solids to acid ratio after Fisher during most seasons. Thomson was one of the bud sport selections made from Washington navel on the property of A. C. Thomson in Duarte CA about 1891. 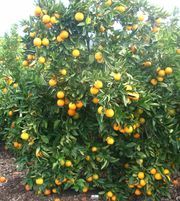 Thomson was planted extensively for years because the fruit matured approximately two weeks earlier than the Washington navel orange fruit. The fruit is a bit more elongated in shape and has thinner and smoother rind than the Washington navel. The juice vesicles are ricier in texture and less distinct. Although Thomson fruit mature earlier than Washington navel fruit, they do not hang well on the tree. The tree is productive, but the fruit do not reach the quality of Washington Navel. The only real advantage is the early maturity. There are several improved varieties of Thomson. The pictures are of the Thomson Zimmerman variety. Cara Cara is a blood orange. It is discussed in >> Light blood oranges. 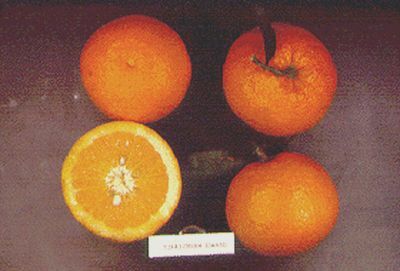 Fukumoto navel orange selection was introduced into California from Japan via the USDA Glenn Dale quarantine facility in 1983. S. Fukumoto, from Kokawa-cho in Japan was the first to grow it in Wakayama Prefecture. 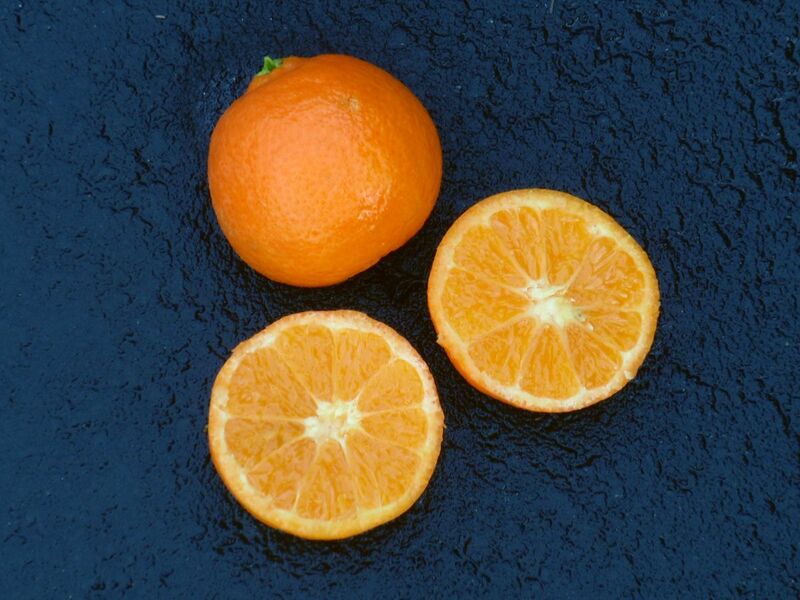 This early maturing navel orange reaches legal maturity three to four weeks before Washington navel and is one of the earliest to reach color-break. One of its most outstanding characteristics is the deep reddish rind color. The fruit are harvested from mid October to late December in California. 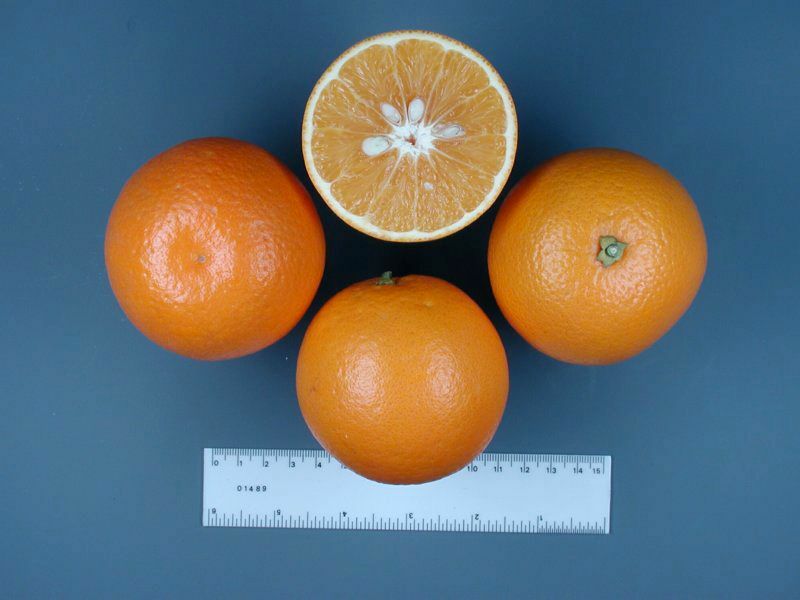 Fukumoto trees tend to be smaller and appear to produce more chimeras than most navel orange selections. Another major concern is the decline of Fukumoto trees grown on C-35 citrange and Carrizo citrange rootstocks. Trees propagated on Carrizo exhibit symptoms of foamy bark rot syndrome which includes lanky zigzag shoot growth, with development of abnormally large leaves and oozing of gum at the base of shoots and through splits in the bark at the crotches of branches. Fukumoto trees propagated on C-35 have symptoms that are more typical of a genetic rootstock/scion incompatibility. 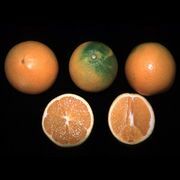 These symptoms have also been observed when Fukumoto is grown on Swingle citrumelo rootstock, but not when grown on Sour orange or Volkameriana rootstocks. Newhall nucellar navel orange is a seedling nucellar selection that originated from the old budline Newhall, which in turn originated as a limb sport of a Washington navel orange in the Duarte area and was selected by Paul Hackney of Newhall Land and Water Company of Piru. 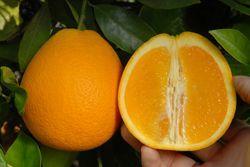 The fruit of Newhall mature slightly earlier and are slightly smaller in size with deeper rind color and flesh color than Washington navel orange. 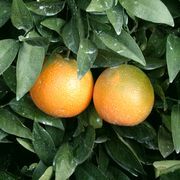 Newhall navel orange trees are somewhat less vigorous and have leaves that are slightly darker in color than Washington navel orange trees. 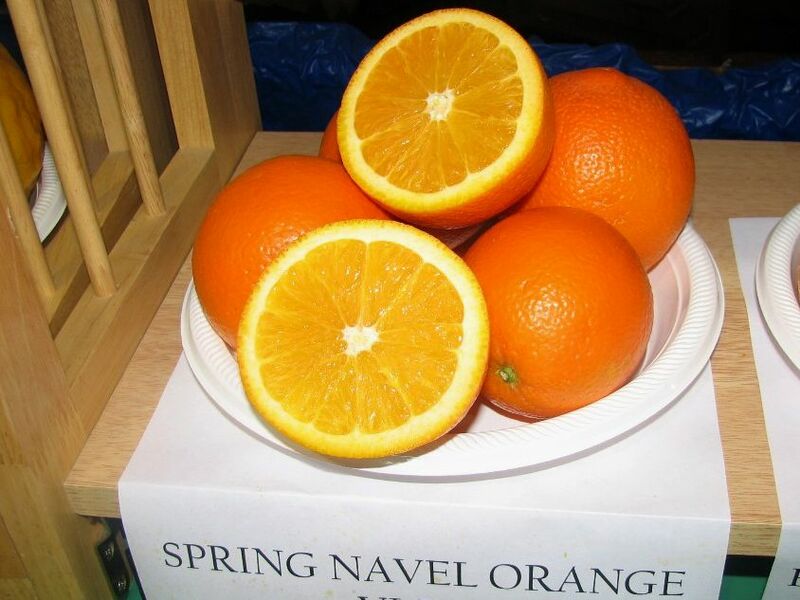 New Hall navel orange is also known as Newhall and Naveline. Spring Navel is a bud sport of Washington Navel discovered in a grove owned by Don Fulbright near Porterville, California. 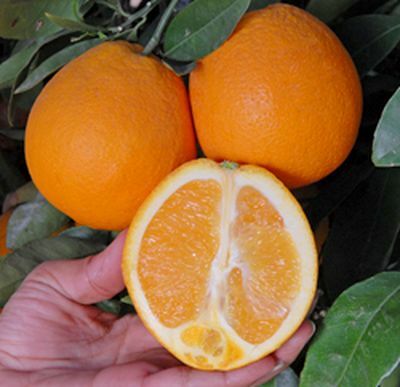 It was first propagated by Willits & Newcomb Citrus Nursery around 1985 and was thought to be a late navel. As the trees matures it was realized that spring was more a late-midseason variety and filled a void between mid-season navels and late ripening Australian late navels. 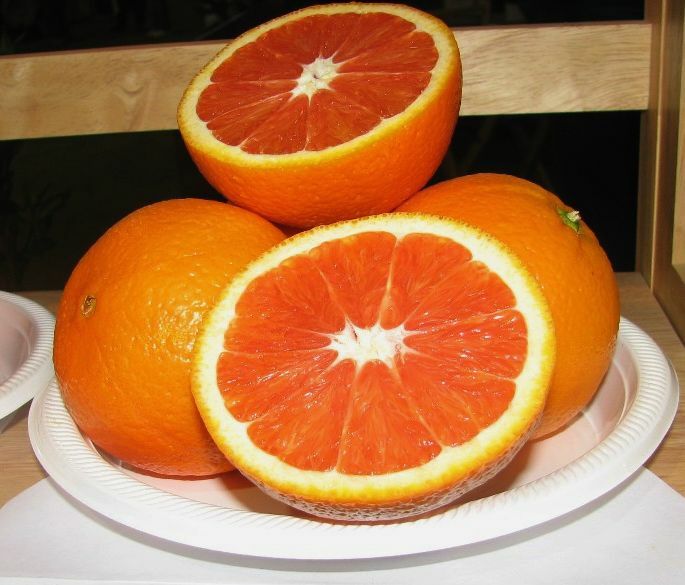 Seedless, medium-large fruit round in shape. Deep reddish-orange color with firm smooth rind. Medium thick rind peels easily to reveal a reddish orange flesh. Excellent flavor with a good sugar-acid ratio. The reddish-orange rind color, usually associated with early navel varieties, makes Spring an attractive and desirable addition to the mid-season market. 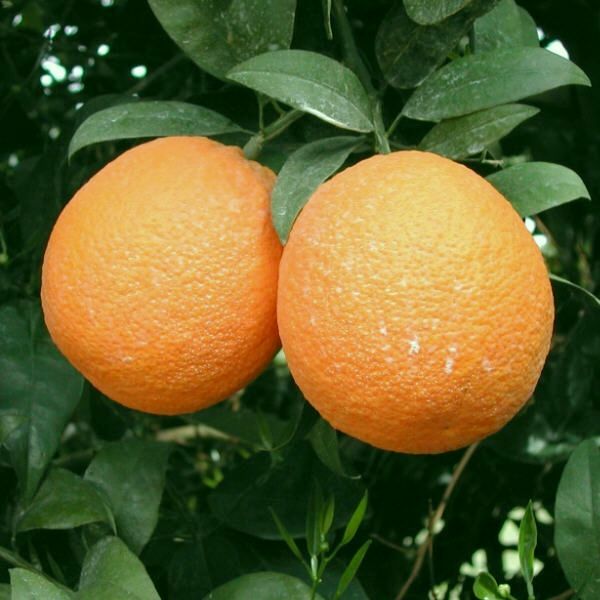 Washington Navel is either identical with the Brazilian 'Bahia' navel or a close mutant of it. It was imported from Brazil to Washington in 1870 and developed for release in Riverside, California. 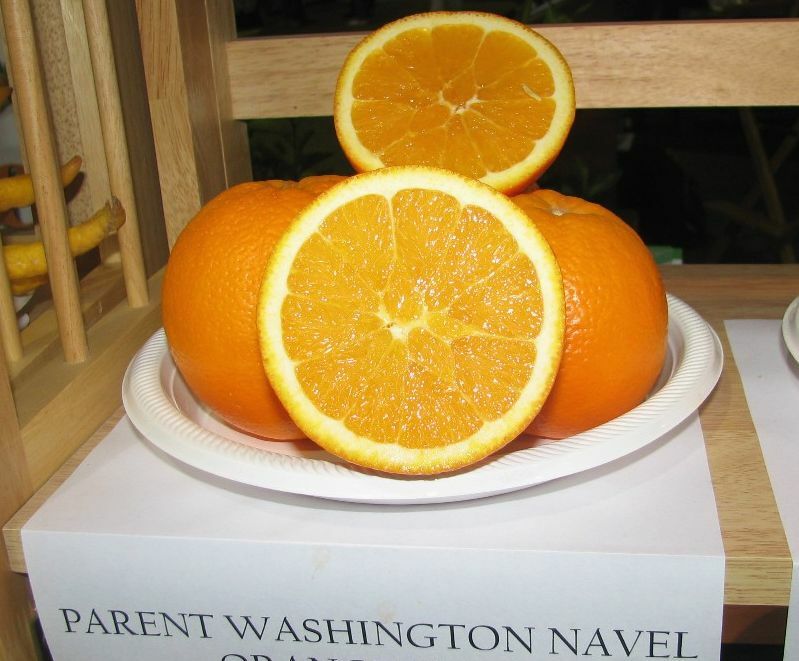 Washington Navel is the second most important orange variety in the world after Valencia. It is the leading variety in Brazil, California, Paraguay, South Africa, Australia and Japan. The large exceptionally delicious round seedless fruits are rich in flavour and have a slightly pebbled orange rind that is easily peeled. The Washington navel is early in maturity, at its best in the late autumn to winter months, but will hold on the tree for several months beyond maturity and stores well. The original source of budwood for this variety, the Parent Washington from 1873 is still alive in Riverside and produces fruit. It was 134 years old in 2007. The picture in the middle was taken in 2005. There is an interesting slideshow by Roistacher C.N. at Ecoport telling the story of the tree. The fruit was medium yellow and had a thick rind that came off easily. The segments were seedless, loose, very juicy and very sweet. The sugar to acid balance was on the sugary side but had enough acids to make a pleasing citrus flavour. The texture was firm but melting. 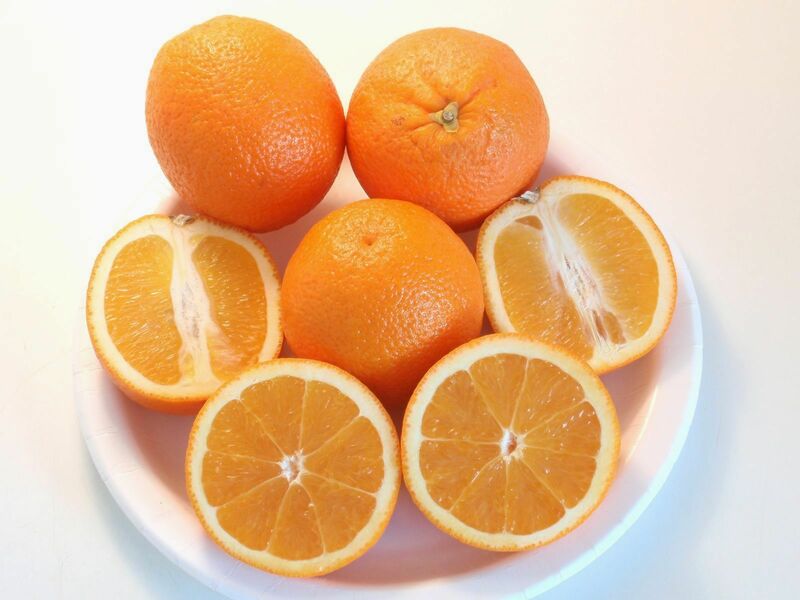 All in all one of the best oranges to eat fresh. 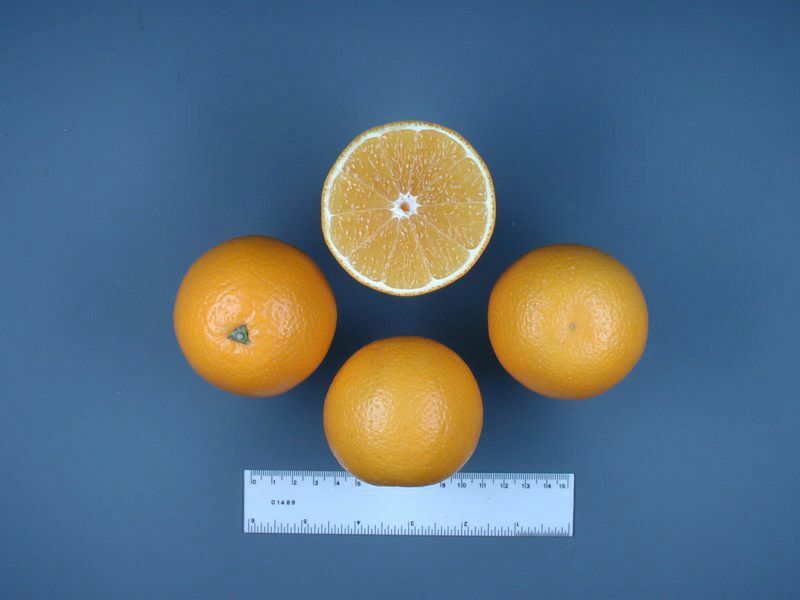 A number of new late-maturing navel orange selections were identified in Australia in the late 1980's and early 1990's and five of them were sent for evaluation to the CCPP in California and were later released for propagation. 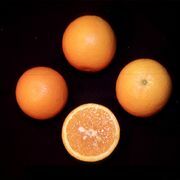 Autumn Gold, Barnfield, Chislett, Powell and Wiffen are new late maturing navel orange varieties. They are patented, propietary cultivars owned by their original Australian selectors who have licensed the propagation rights to various Californian nurseries. 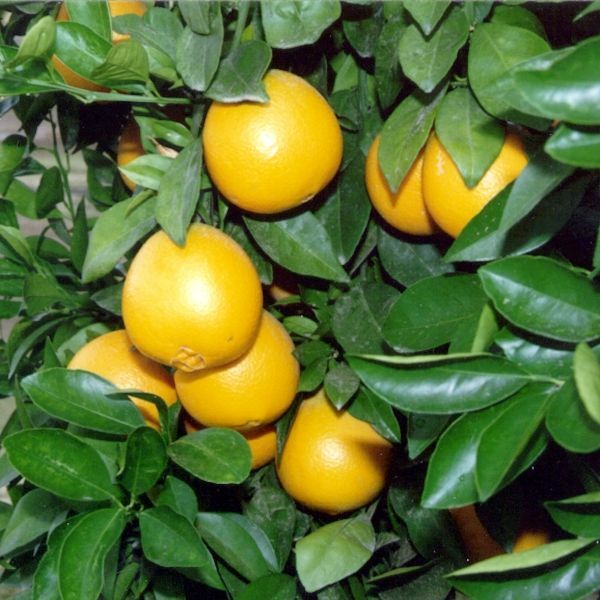 Currently these varieties are propagated for planting in the UC-Riverside CVC and commercially available from the Citrus Clonal Protection Program (CCPP). Autumn Gold was originally selected by Jack Pollock, Mourquong, NSW, Australia, circa 1950s; apparently a sport of Washington navel; also known as Pollock Late Navel. Barnfield was first selected by Wayne Barnfield, Ellerslie, NSW, Australia, circa 1985. 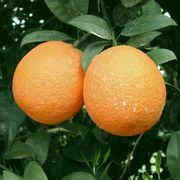 It is apparently a sport of Washington navel; said to have good size and carry well on tree without chemicals until June. Chislett was first selected by N.A. Chislett, Kenley, Victoria, Australia, circa 1986 and is a sport of Washington navel. Powell was first selected by Clive Neil Powell, Curlwaa, NSW, Australia, circa 1978; apparent sport of Washington navel. Wiffen navel orange was found in early 1980s on Wiffen's property, near Nangiloc Victoria Australia. It is said to mature at about the same time as and to hang on the tree as well as 'Lane Late', but to have more solids and juice content and lower granulation late in the season. evaluated for quality characteristics" was conducted at the UC-Riverside CVC in 1997-2001. It gives a closer look at the varieties and their slightly differing characteristics. Discovered on the property of Lindsay Lane at Curlwaa, New South Wales, Australia in 1954. Presumed to be a limb mutation of Washington navel. Lane Late navel orange is a late maturing navel orange and was the first of a number of late maturing Australian navel oranges that are either bud sport or limb mutation selections of Washington navel. 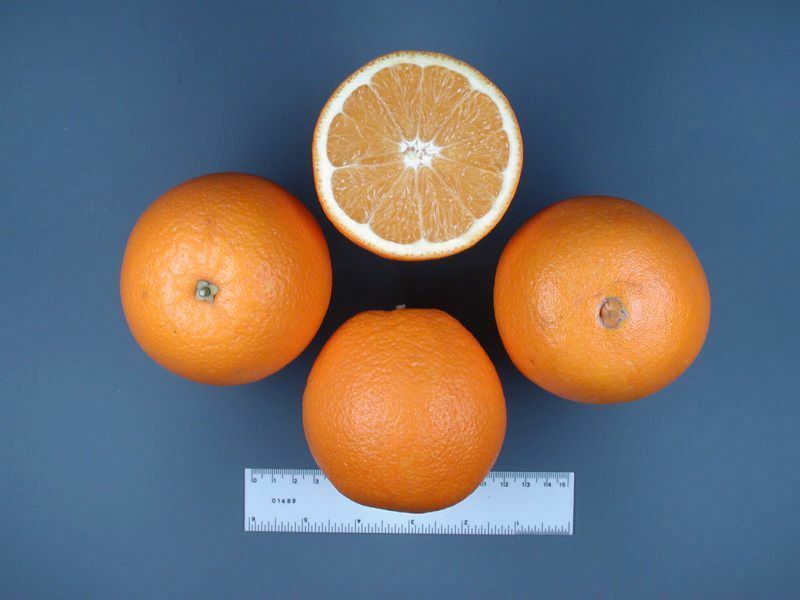 The tree characteristics are very similar to those of Washington navel orange. The fruit is of similar size and shape, but it has a smoother peel and a slightly smaller navel. The fruit matures four to six week later than the Washington navel orange and stores on the tree for several months after reaching maturity before the quality deteriorates. evaluated for quality characteristics" was conducted at the UC-Riverside CVC in 1997-2001. It compares Lane Late and a number of newer late navel varieties. Because of the popularity of the early maturing navel oranges, varieties of the same kind that would ripen later in the season have long been developed. A limb sport of a Washington Navel tree was spotted in the Castellon Province of Spain in 1948 and released in 1957 as Navelate. The fruit is smaller but juicier than Washington, round in shape with a thin peel. 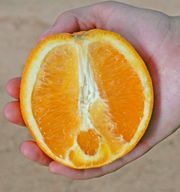 The navel structure is also smaller and in some fruit is missing completely. Navelate fruit can keep on the tree for four months without loss of quality. 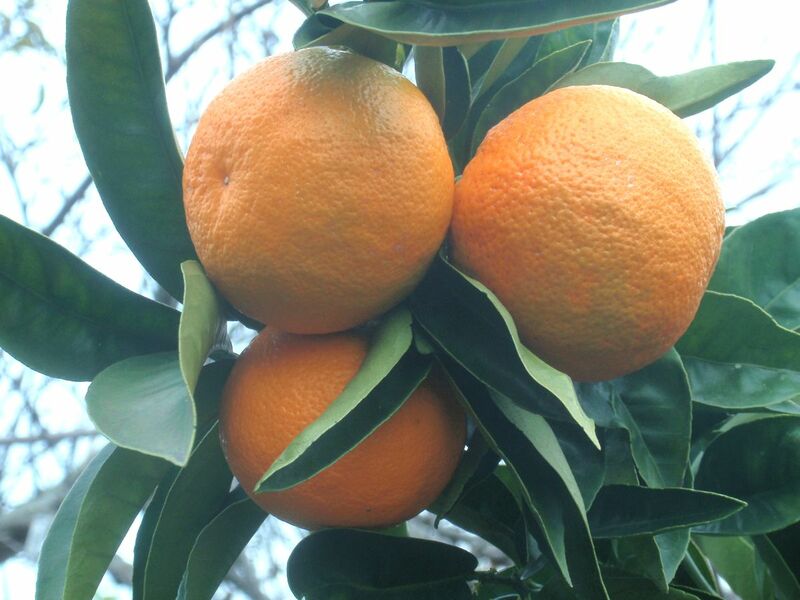 Ricalate, a fairly recent Spanish navel variety, was discovered in 1977 as a spontaneous mutation of a Washington Navel tree in Ribera de Cabanes, Castellón province, Spain. Ricalate variety was released in 1990. The tree is vigorous and medium-sized, spineless and productive. The fruit resembles Navelate in shape but matures later. Holds very well on the tree without losing quality. 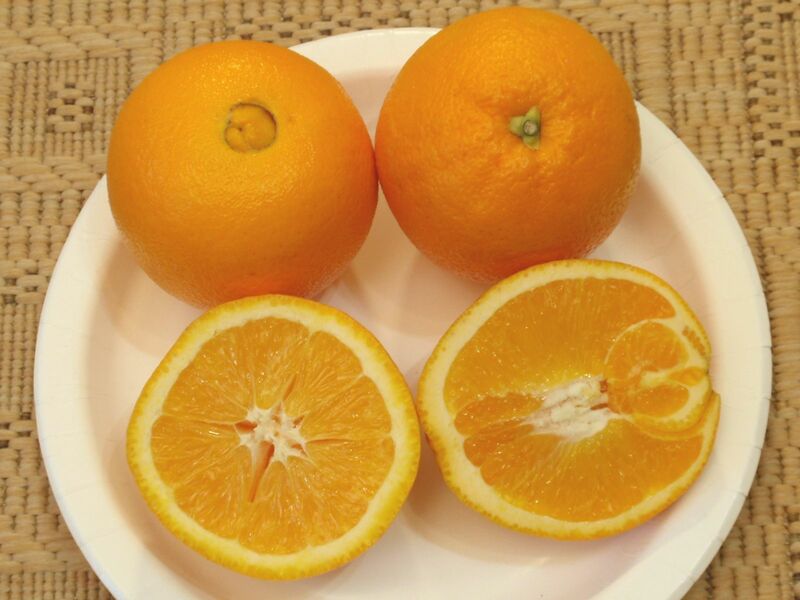 As is the case with many navel oranges, Ricalate loses some of the acidity in the juice with more time on the tree. However, after picking the juice slowly gets more acidic if stored for a longer period. 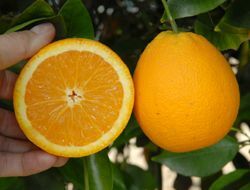 Even if Ricalate does not reach the full quality of Washington Navel it is an important variety in Spain because of its maturation later than Navelate and its ability to hold well on the tree. 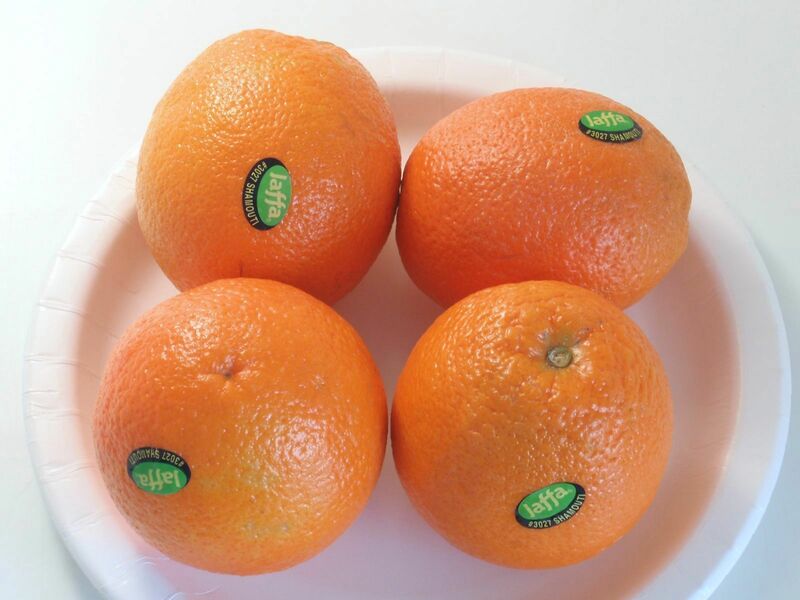 Rohde is a more recently imported navel orange selection from Australia. It matures about the same time as Lane Late and can be stored mature on the tree about the same time as Lane Late before granualtion becomes a commercial problem. Rohde is said to have more flavor than Lane Late in most months and a similar amount of juice and acid, but has a lower percent granulation problem late in the season. Slightly oblong fruit in some seasons, usually round. It may have a slightly coarse or rough skin texture especially late in the season or when excessive amounts of fertilizer are applied, or when the crop is light. Fruit size is the same as Lane Late. It is likely to produce more fruit per hectare than Lane Late. 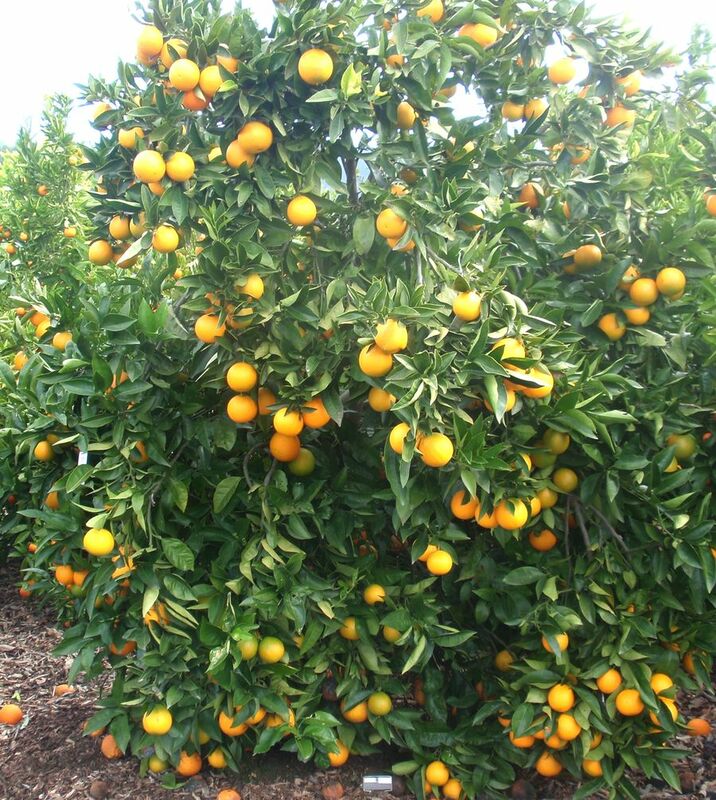 All tristeza tolerant rootstocks can be used depending on soil type as for other oranges. 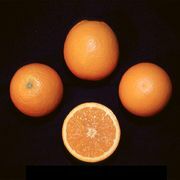 Chironja comes from Puerto Rico and exhibits resemblances to both the orange and grapefruit, particularly to the latter. The name is a combination of Chi(na), the local term used for the sweet orange, and (to)ronja, the Spanish word for grapefruit. Chironja was found in 1956 as a wild seedling tree in the mountainous section Puerto Rico. Later other seedling trees were found in isolated areas of the coffee zone. 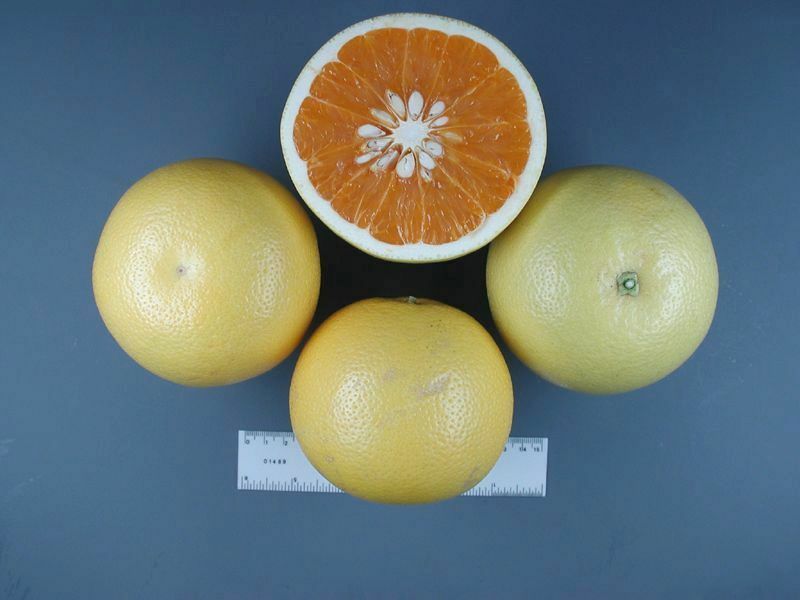 The fruit is large (grapefruit size) and has a few strongly polyembryonic seeds. Rind is medium-thin, smooth, moderately adherent but easily peelable. 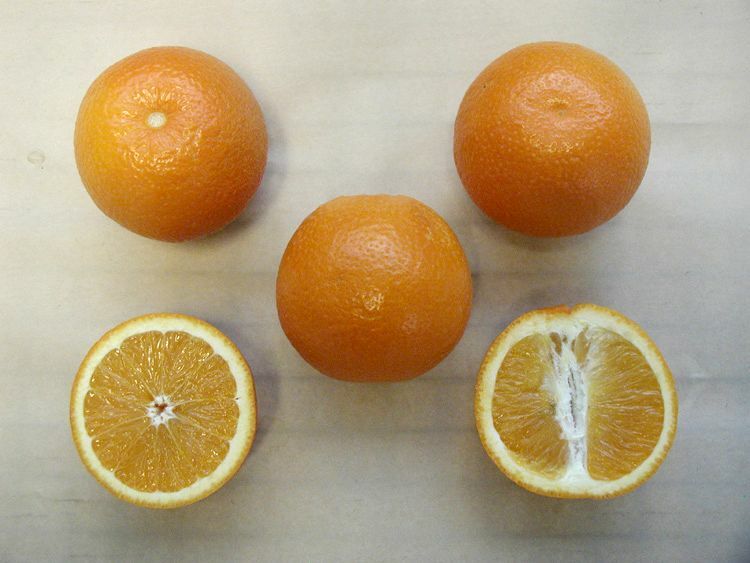 Segments about 10, central axis medium-large and semi-open. 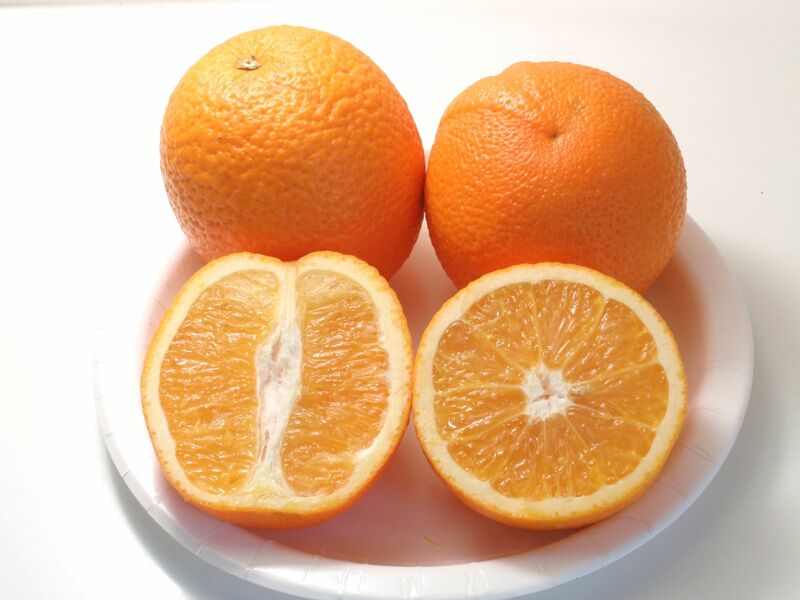 Flesh is yellowish-orange, tender and very juicy. The flavour is mild, lacking the bitterness of the grapefruit. Midseason in maturity and fruit holds well on tree. Tree is vigorous, large, and grapefruit-like; leaves broadly winged, somewhat cupped, and margins irregularly undulate. Fruits usually borne singly rather than in clusters characteristic of grapefruit. 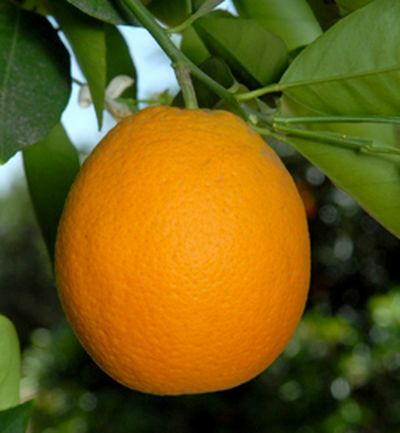 A seedy, orange-fleshed fruit that matures slightly earlier than grapefruit because of its lower acidity. It is known by various names, including 'New Zealand Grapefruit', and 'Poorman's Orange'. 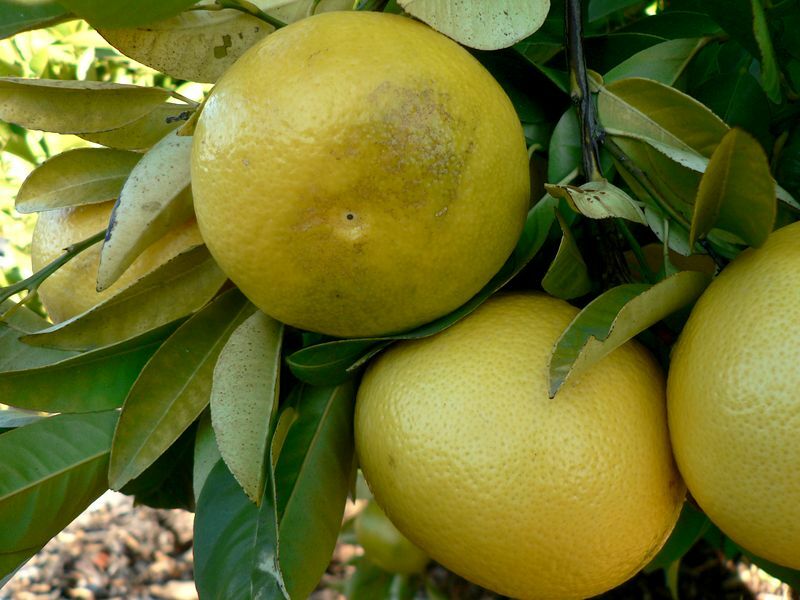 The fruit and tree are very similar to grapefruit, but it is probably a pomelo hybrid or a natural tangelo that may have originated in China or Australia. The fruit has some resemblance to the Attani of India and the Natsudaidai and Asahikun of Japan. 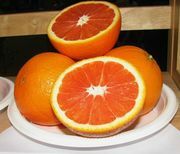 A total heat requirement considerably lower than for any of the true grapefruits is indicated by the earlier maturity of Poorman and the fact that it ripens in New Zealand and parts of southern California where there is insufficient heat for any of the regular grapefruit varieties. Nucellar embryony (notated Nu+) is a form of seed reproduction that occurs in many citrus varieties. During the germination of seeds from plants that possess this genetic trait, the nucellar tissue which surrounds the embryo sac in the ovule can produce additional embryos (polyembryony) which are genetically identical to the parent plant. These nucellar seedlings are essentially clones of the parent. By contrast, zygotic seedlings are sexually produced and inherit genetic material from both parents. Roose, Mikeal: Molecular Genetic Analysis of Nucellar Embryony in Citrus. 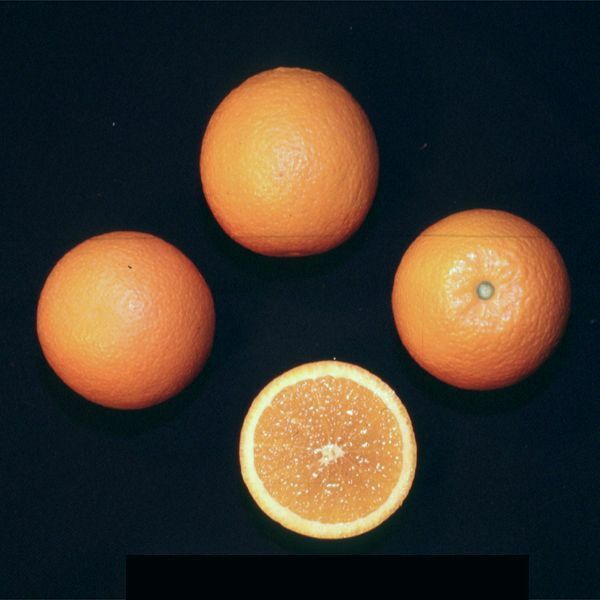 Citrus Research Board 2000 Annual Report.